great tread! 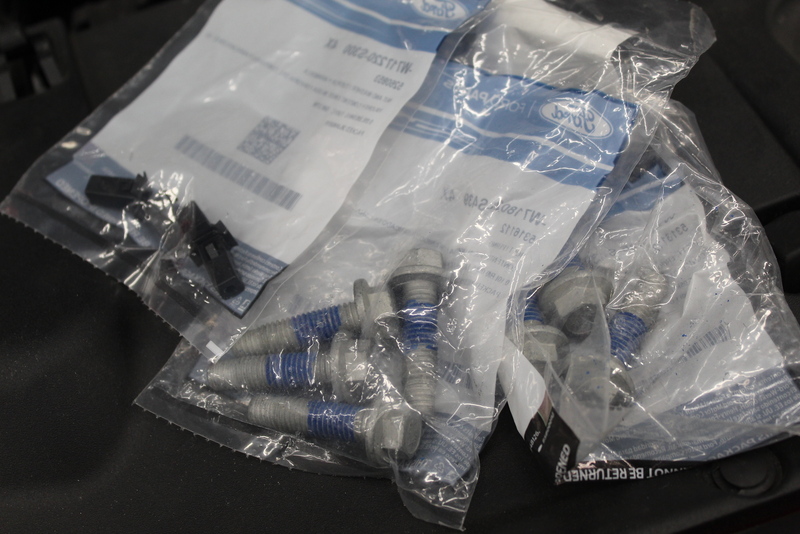 Are your race seat brackets sliders available for the S550? Project Update for April 15th, 2019: The last update was cut short due to the volume of info we had to share and the limits of most peoples' attention span. 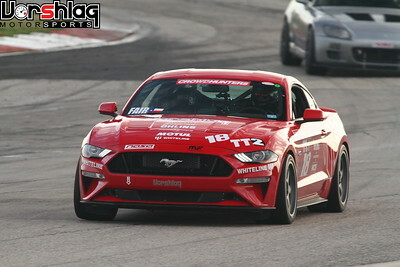 This time we will cover the event right after the first round of 2019 mods (power! 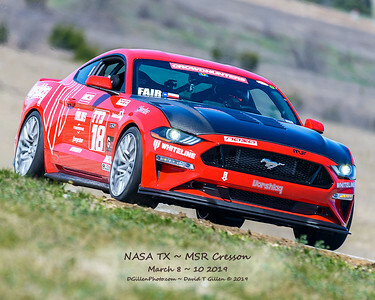 ), which was the 2019 season opener NASA TT event (where we ran the car in TT2) in January. 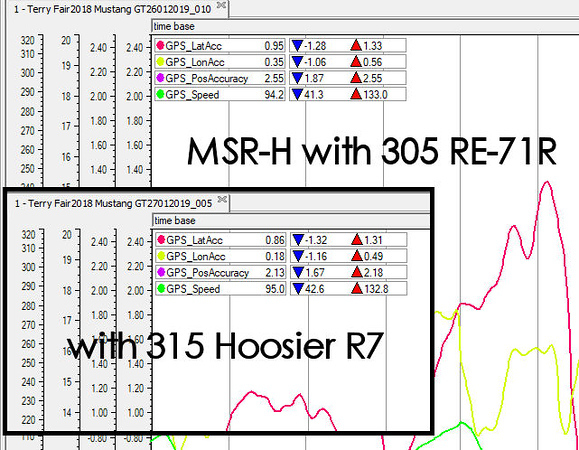 While running at MSR Houston that weekend we got more RE-71R vs Hoosier R7 lap times to compare, then another round of work followed that event that we will cover. 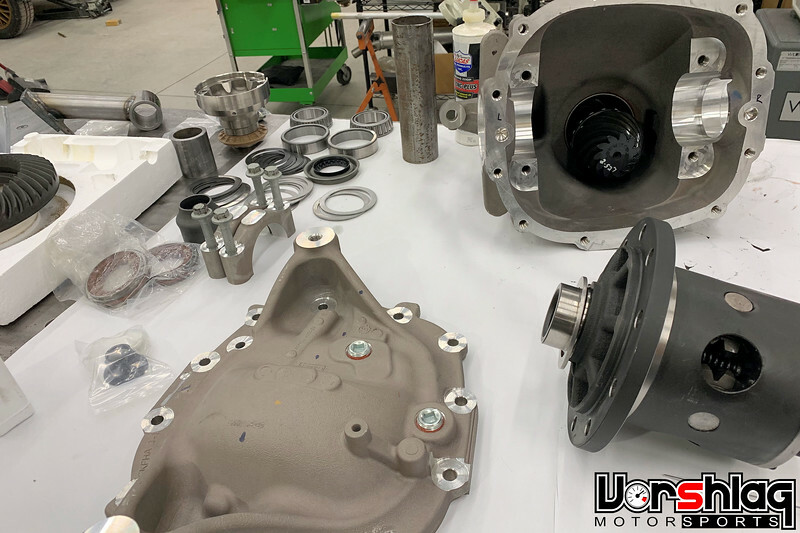 This post MSR-H work included a LOT of things: a gearing/speed analysis, the Auburn Pro diff + 4.09 gears + aluminum diff housing build up and install, which included both a last minute rear axle install and an S550 pinion flange / driveshaft "running change" issue we found. We will also show the new Anderson Composites GT5 carbon fiber hood install (with weights), PP2 splitter install (and the many items we had to order! 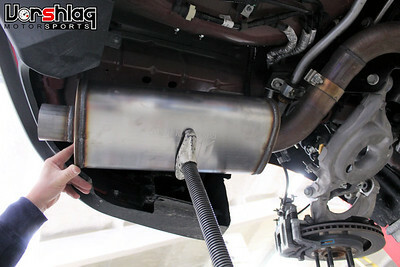 ), show some wheel/tire weights, a new rear muffler upgrade, Mishimoto radiator install (and weights), and stop there. 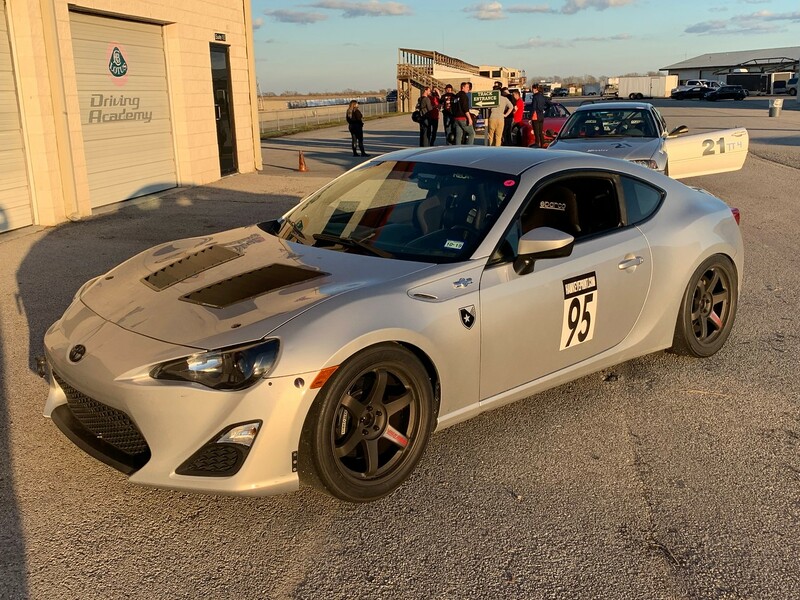 We have since changed classes again (above) and attended another NASA TT weekend (March, TT3) plus an Autocross (CAM-C), but we will cover those events next time. The power level and weight are both getting to the point where it is nearly impossible to stay legal for TT3, so look for a move back to TT2 for the rest of the season for this car. 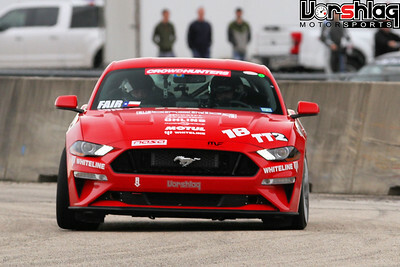 The TT2 and TT3 classes are serious enough in Texas region that it looks like we might not be competitive (we'd do better in TTU or TT1) in a street car we refuse to cut on - so be it. The NASA classing is secondary to the parts development and raw lap times we are wringing out of the car. 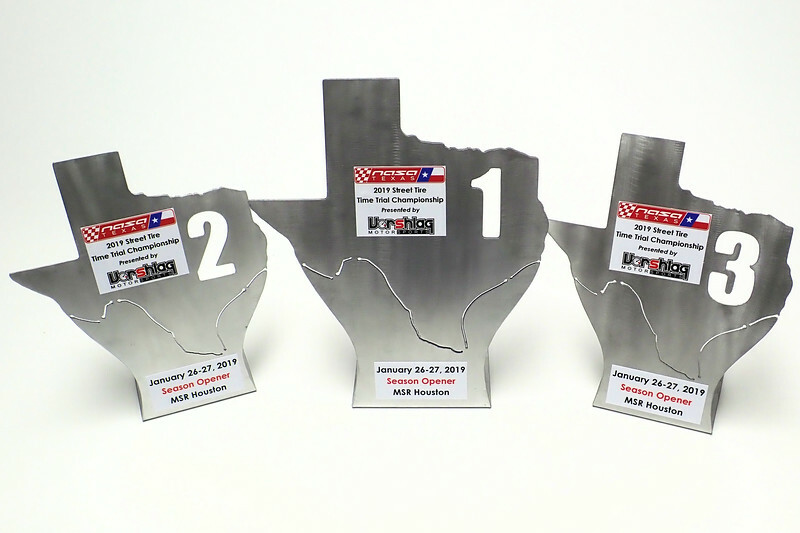 We are sponsoring a new series of 200 Treadwear sub-classes in TT for NASA Texas in 2019, and made these Trophies for those entrants. We made these on our CNC plasma table, then cleaned up the surfaces, and bent them to shape. With some graphic design done we ordered decals and applied them. Came out pretty slick. Of course we were down to the wire making 40 trophies, until the night I loaded up for the event. But deadlines lead to progress! 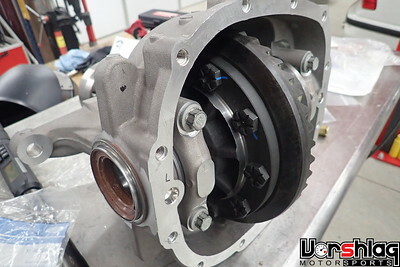 That event highlighted not only that you shouldn't up-class when you are 500 pounds too heavy, but also how badly the gearing and worn out OEM Traction-Lok differential were. 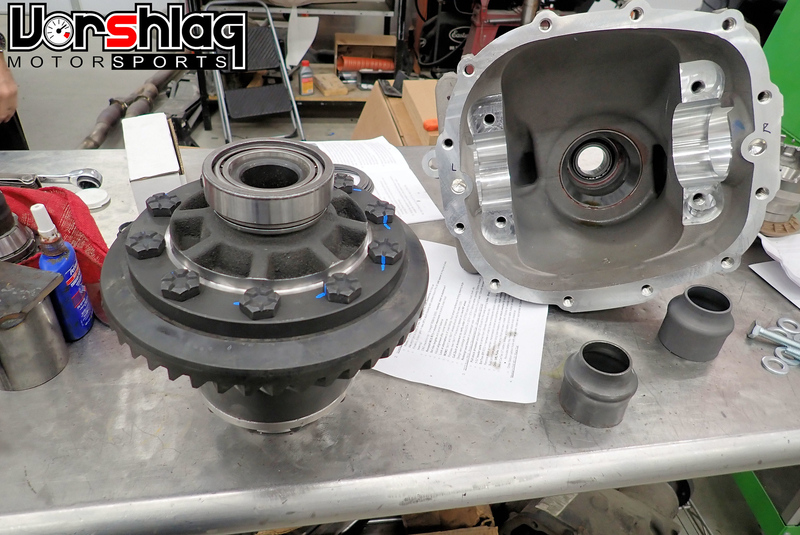 Since then we have finally made the upgrade to the built aluminum "Super 8.8" housing, new gears, and a prototype Auburn Pro differential. Wish we had the time to get it finished before this January event, and that plus being wildly overweight/under powered for TT2 definitely put us on the back foot for the weekend. Of course TT2 became the largest and most competitive class at this event - I sure can pick 'em! Amy and I left early Friday morning to make the 6 hour tow down to the southern tip of the greater Houston area from our shop at the extreme northern end of Dallas metroplex. 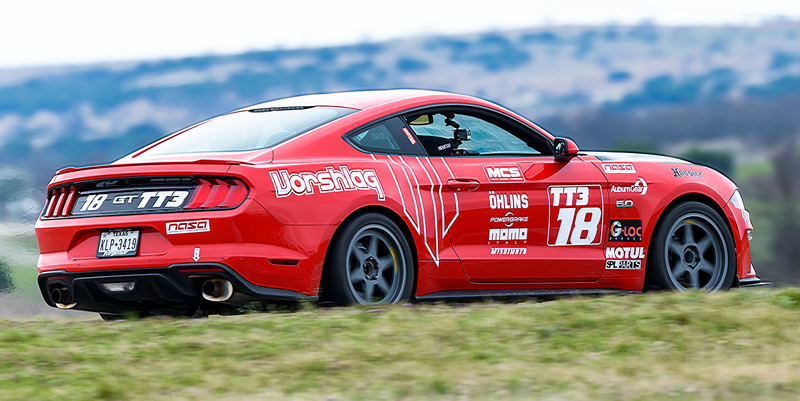 We got there at 1 pm and in hindsight, we should have done the relatively inexpensive test day at the track, to try out all of the new changes to the car over the Winter and work on dialing in the new setup (going from Ohlins R&T back to MCS RR2 remote dampers and stiffer springs). Saturday morning we got there with a brand new set of 200TW Bridgestone RE-71R street tires mounted onto the new RF-20 MOMO 19x11" wheels. The plan was to run Saturday on 200TW tires (for test purposes and to support the new sub-class) and switch to R7s on Sunday. 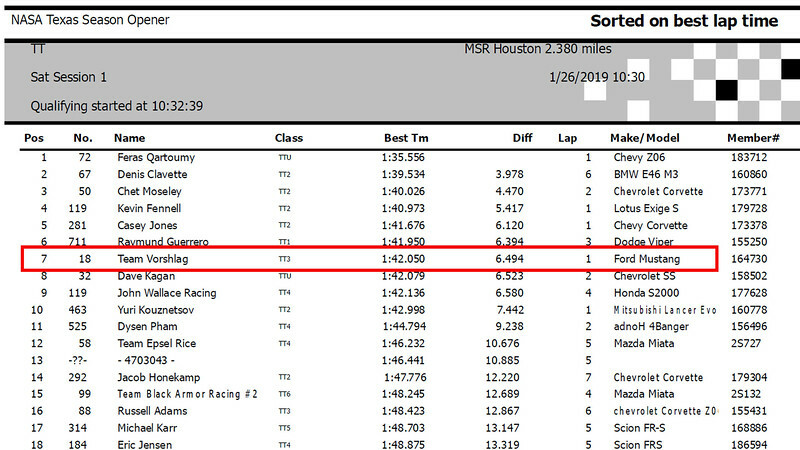 I ran the Saturday "TT warm up" session and was 4th quickest of all of the ~30 TT cars, on street tires, so I felt good about that. 1:43.0 lap. This of course gave me a false sense of security, as the other drivers got a LOT faster in later sessions. 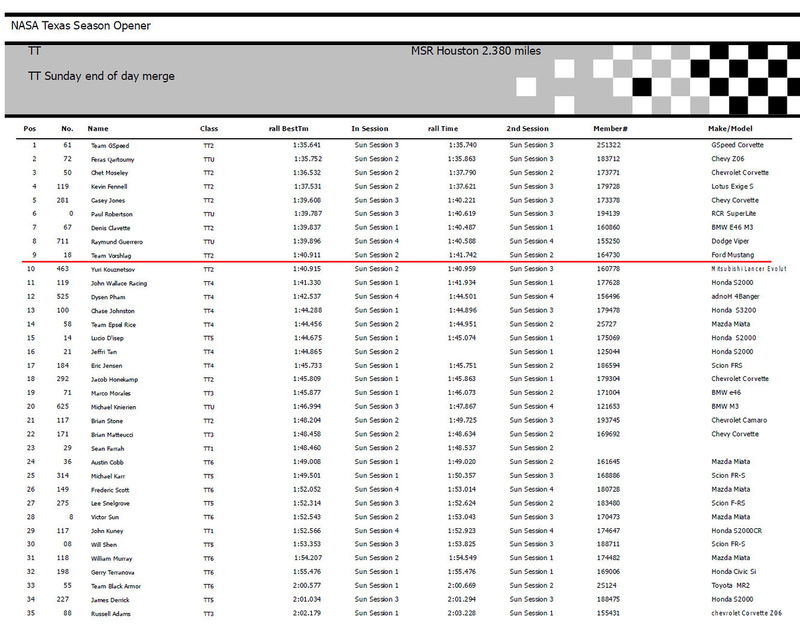 Making a good time in TT practice put me pretty far up the grid, which gave me clear track for the first few laps. In the second TT session I went out and ran a 1:42.05, but predictive showed high 1:40s. I went out again in TT session 3, but with rising track temps, I could not find any more time. 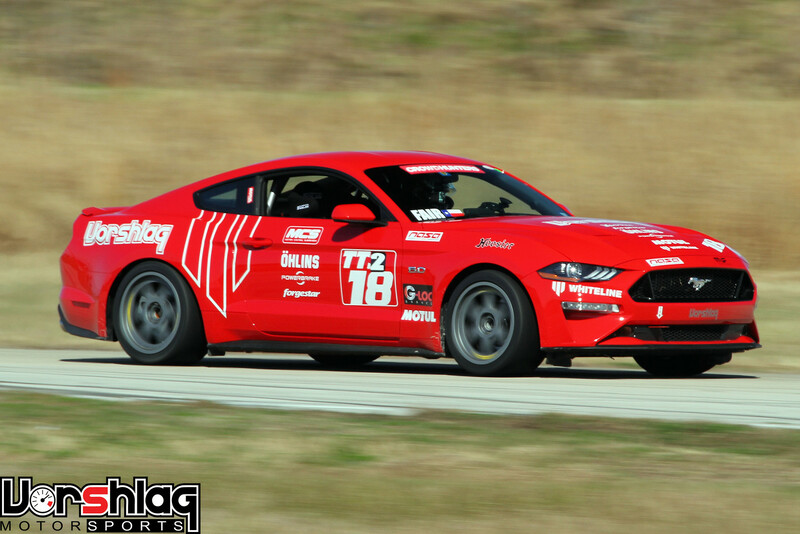 Took my HPDE1 student (GT350 owner) out for a few laps in HPDE4, to give him a sense of the lap times his car is capable of - and he really enjoyed it. Throughout the day I fell from 4th fastest all the way to 8th on the grid going into the final TT session, as others found more time in their cars. I guess I found our car's best laps early, while the steadily increasing ambient and track temps tapered my times off later in the day? Never felt like I really nailed the laps on street tires, for a number of reasons. 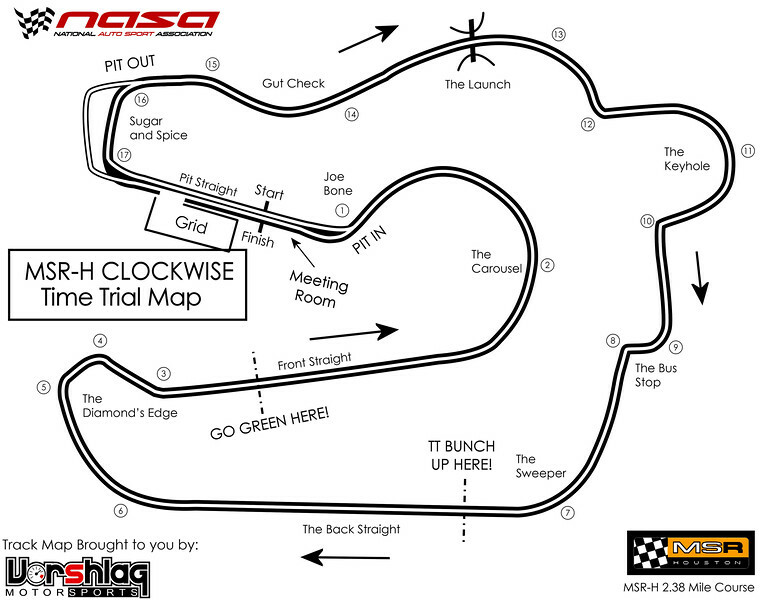 I don't run at MSR-H more than one event per year, and sometimes we switch configuration from CW to CCW from year to year, so I always feel like I am still learning this track. I never do all that well here. Watching the in-car video above of my 1:42.0 laps, sure there are some issues and of course driving mistakes. The rear rebound was set too soft, and it takes a bit of work to access the knobs for that on the inverted rear (we should have a revised MCS setup soon that will make it easier to reach the Rebound knob). I turned the Rebound up a LOT and it settled down in later sessions on this bumpy track, but I couldn't find more time. The extra power we added was very nice but the noise level was LOUD AF. I vowed not to run another event with a car this loud that is also this slow. The extra power and torque from the long tubes/CAI/tune made the "wrong gearing" issues even worse. Having to use 2nd gear in the Diamonds Edge and Sugar and Spice corners and stuck in 3rd gear in the Carousel made the rear end want to step out ALL THE TIME. I tried laps using a higher gear in these corners - it was easier to drive, but considerably slower. 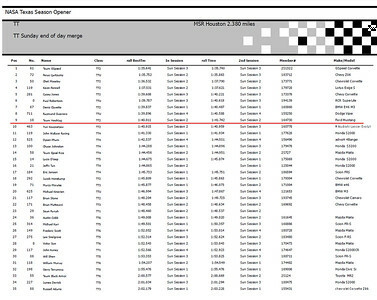 Kind of disgusted how far off the TT2 pace I ended up, but again - it was 500 pounds heavy + narrow street tires + no aero, in what was a TT3 legal car (with the bonus for 100+ TW tires). 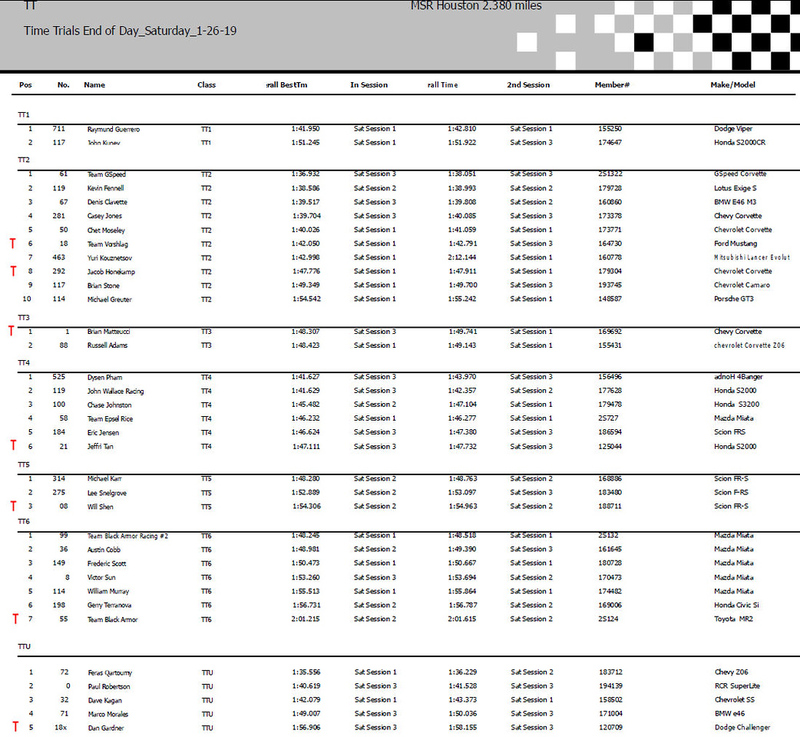 I would have handily won TT3 that day, even on street tires, but some key TT3 regulars were missing. Engine oil temps were fine, and trans temps as well. Diff temps were moving up fast, sitting on the 250°F limit of the gauge after 4 laps. I kept the lap count shorter to minimize the diff temp issues, but we had planned on the new aluminum diff housing going in before the next event. Other than diff temps the car was flawless - brakes, handling, etc. Decent NASA party that night, and the street tire trophies we handed our were welcomed (7 cars declared 200 TW before the day began). 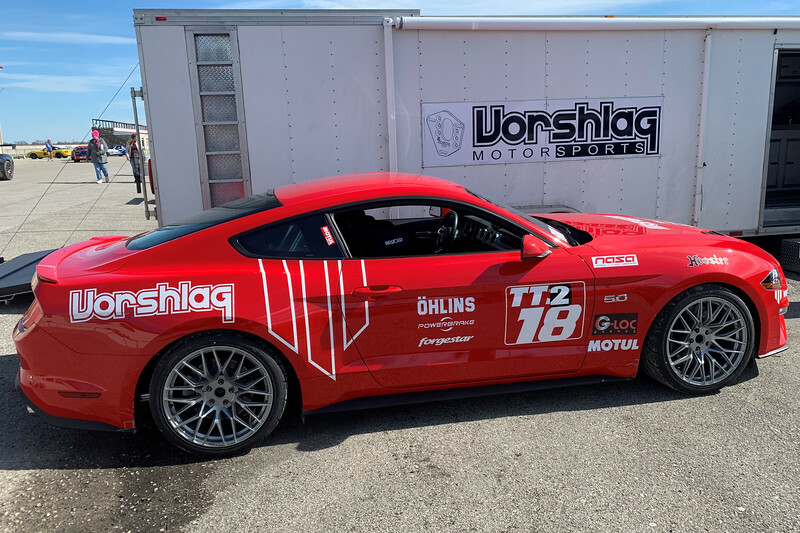 Lots of people still finding out about the 200TW sub-class competition and more folks promised they would look closer at these tires for use later in the year - including some HPDE4 regulars who have TT licenses but didn't want to commit to Hoosiers. I ended up 6th out of 10 in TT2, 11th fastest overall of all cars, and the quickest car of all TT competitors on 200TW tires for the day. When 8 of the 10 cars in TT2 were full aero/Hoosier cars, I should be happy to get mid-pack in what was a TT3 car. I could not blame traffic or poor grid positioning - just didn't have the pace for a serious TT2 effort. 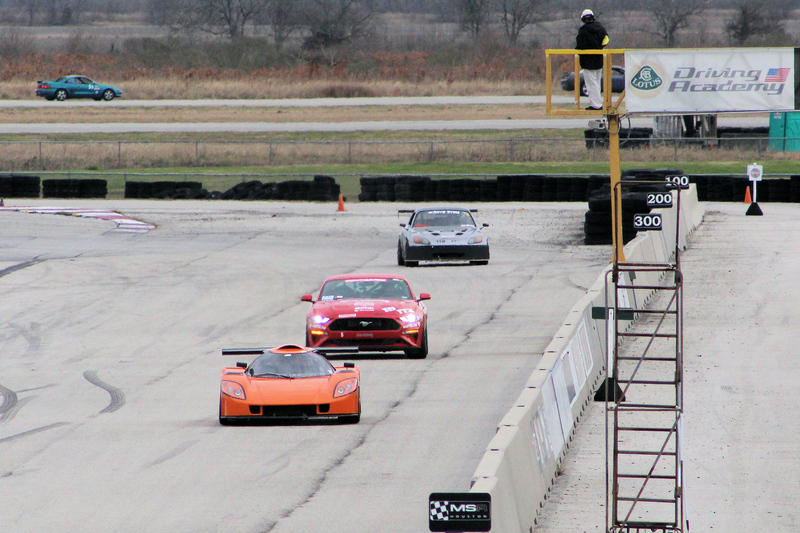 Costas won TT2 in the red G-Speed C5 Corvette (above left), running a 1:36.9 and resetting the TT2 lap record here. 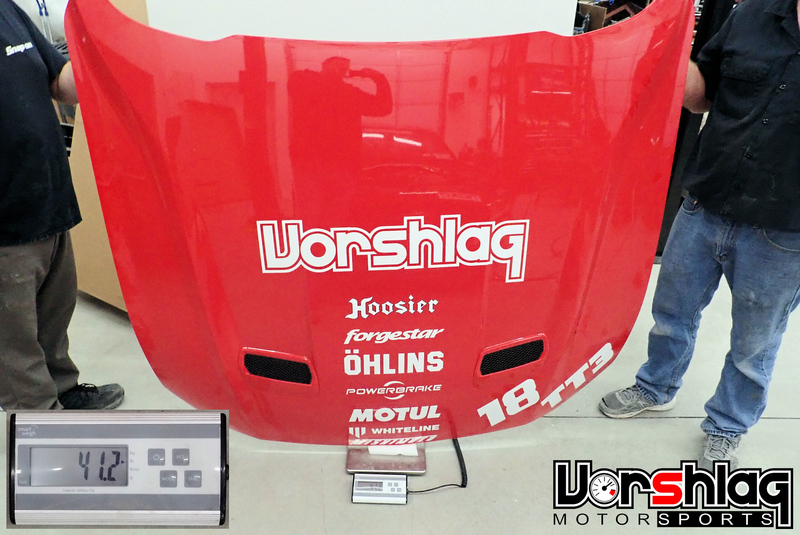 Sticker Hoosier A7s help, as does the HPR built motor was turned up over 100 hp more than when he ran it in TT3 last year and won the TT3 class National Championship. This same car also ran in ST2 with another driver, running double duty for the weekend. Pretty cool. Kevin in a Lotus was 2nd (above right), Dennis in a black E46 M3 was 3rd (below left), Casey's white C7 (below left) was 4th, and Chet's black C5 was 5th. It was good to see Yuri back in his TT2 classed EVO, which we haven't seen in a while. He and I diced it up a bit and I barely stayed ahead of his times. 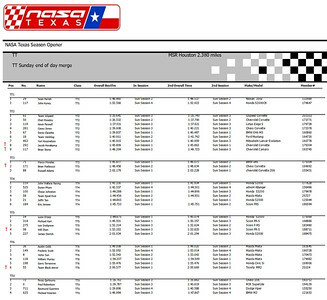 Again, most of this class were prepped race cars with Hoosiers and Aero, except for our car (6th) and another (8th) on street tires. 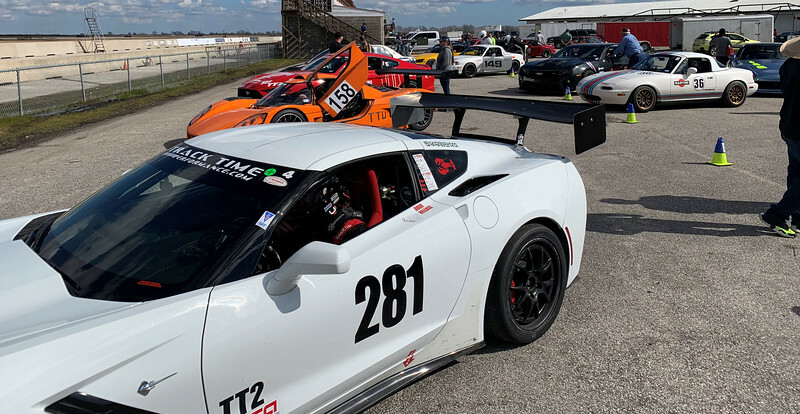 Meanwhile my friend Brian Matteucci won TT3 outright in his 2017 Camaro 1LE... with V6 power, on 340 TW Continental street tires! He was there mostly to do some testing on the new Vorshlag 6th gen Camaro camber plate, which we built and shipped him the prototype of the week before. Worked great and that is in production by the time you read this. 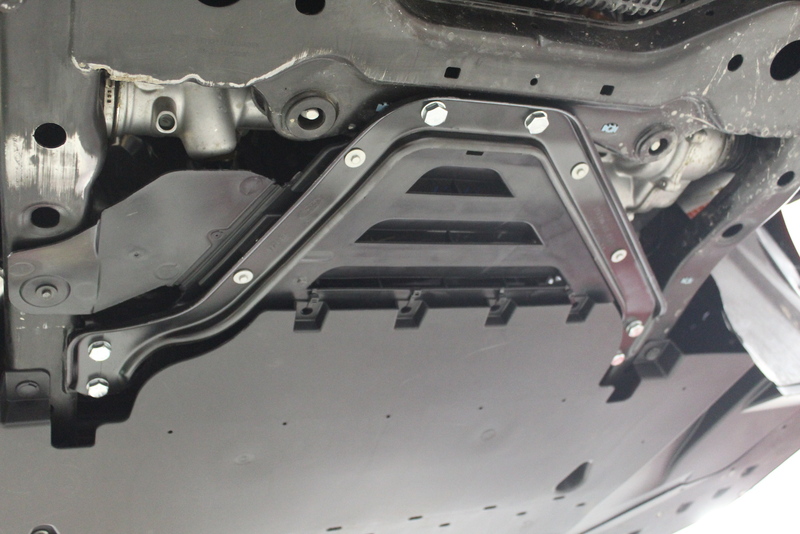 Previously he tested our first OEM perch S550 camber plate, too. 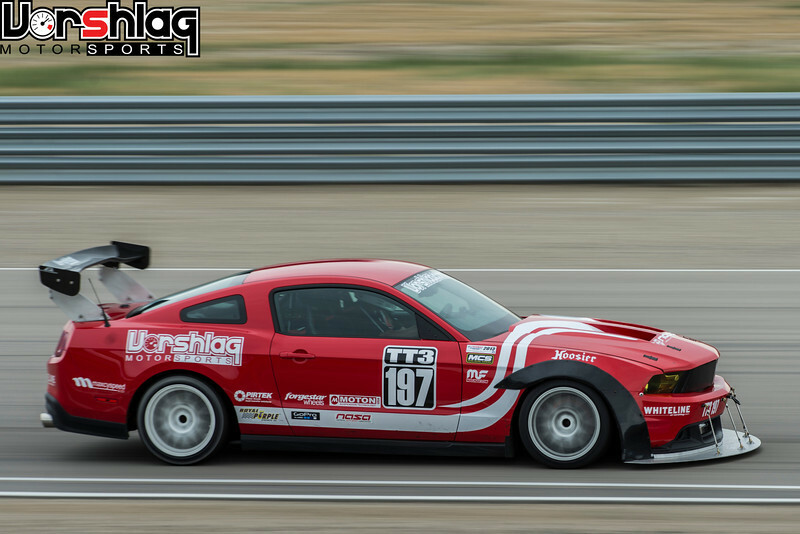 He was the only outright TT class winner on 200TW tires for the weekend. I realized Saturday night that the left front (?) brake duct hose had come off. Last time I showed these wacky experimental 4" stainless oval tubing brake tubes we made for the front, which absolutely did not work. This led to accelerated pad wear on the LF caliper, which I showed in the last update. We mounted up the 18x11" MOMO Classic 6 wheels and new 315/30/18 Hoosier R7s first thing Sunday morning, with a bit of a time crunch involved, and I also "fixed" the brake hose that had fallen off. Vowed to remove these tubular sections as soon as we got back, of course. With the fresh Hoosiers mounted I went out in session 1, but heard a funky noise that sounded like a wheel bearing issue in the rear. I came in after a warm up lap and jacked up the car, checked everything, re-torqued the wheels and went back out in the 2nd session. I thought it was a bad wheel bearing, but it was fine once I drove on it again. Probably just missed a lug nut when torquing the wheels on, in a rush. Still seems crazy that these M14 studs need 140 ft-lbs of torque on the lug nuts, but with 95 ft-lbs it makes a lot of racket. Gotta follow the engineers' numbers! 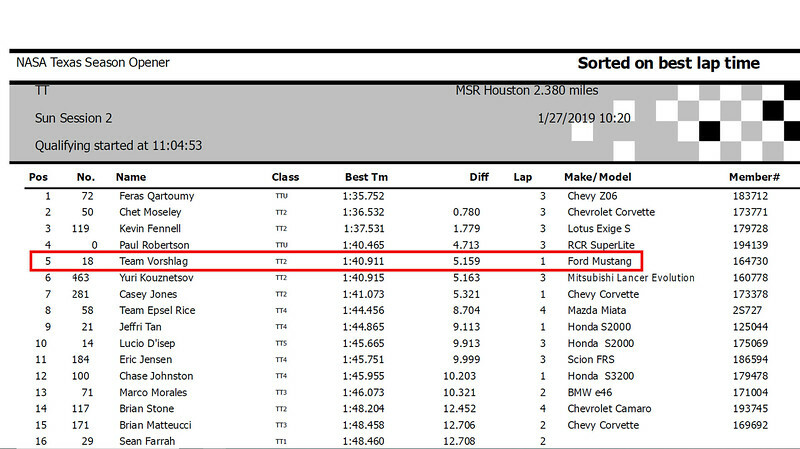 During that 2nd session there was some oil dry down from a previous racer's engine that had ventilated, but I still ran a 1:40.9 on the Hoosiers. Did that on my first lap, where I had gapped Casey's white TT2 classed C7. I caught him early into the 2nd lap, when he had an ICE mode issue with his GM ABS system. He pulled offline and let me by but my lap slowed down a full second. I tried a 3rd hot lap but predictive showed even slower times. By then the front of the field started catching the back markers, and it got impossible to get a clear lap. This time was a little over a second quicker than my best on 200TW tires, even getting held up a tiny bit during that lap. That ended up being my best time, as my next session was hotter and my times were slower. 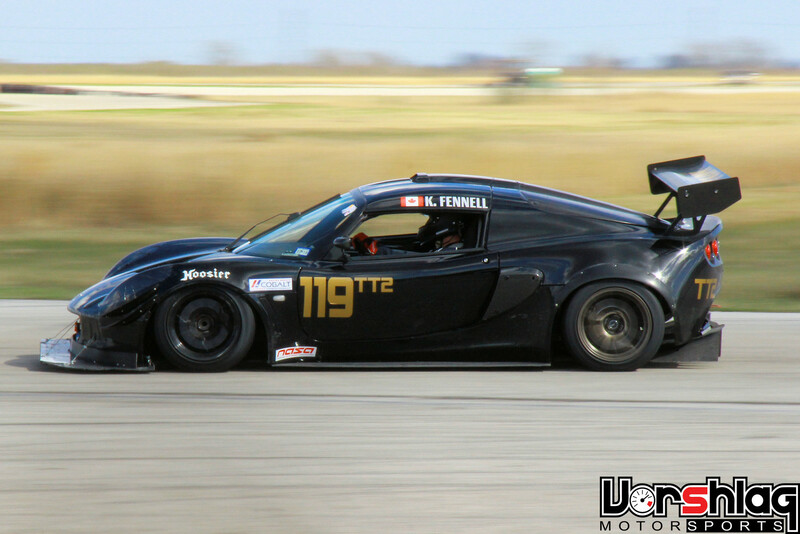 Missing that first Sunday morning session was probably why the gap from streets to R7s was once again only a seond, as that first Sunday session is usually quickest for me in any Time Trial weekend. Oh well, I was so far out of the hunt for TT2 it didn't matter much. Weather was beautiful all weekend, Sunny and in the 50s-60s. 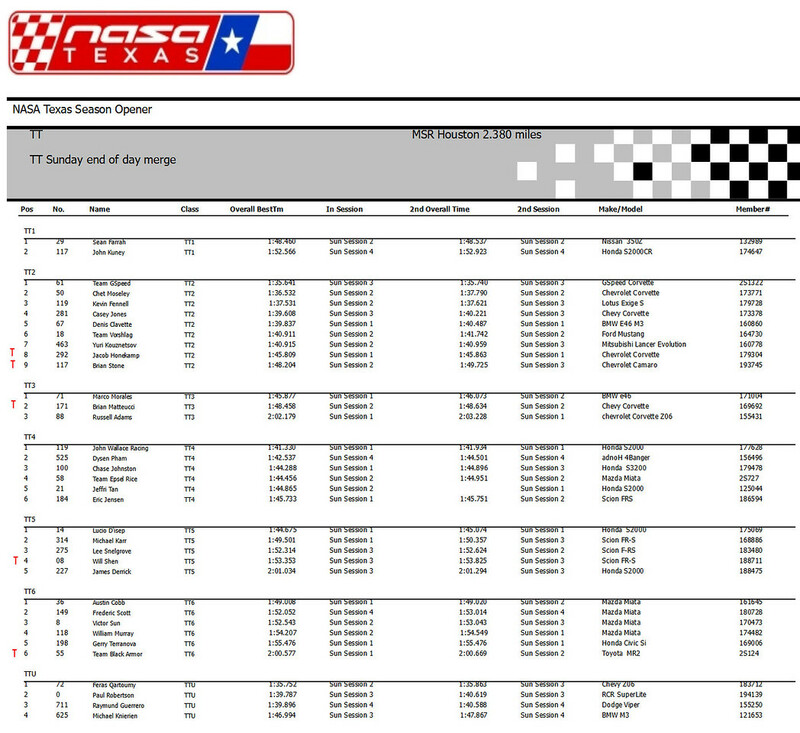 It rained Saturday night - the track was dry and a bit green Sunday morning, but people still put in good lap times. Gearing worked a bit better on the shorter 18" Hoosier tires (25.5") vs the taller 19" RE-71R tires (26.2"), so this cemented our plans to go to 4.09 gears before the next event. 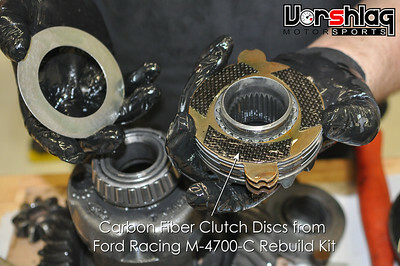 The stock clutch-style limited slip was completely wasted many months before, of course, and that is costing us time. 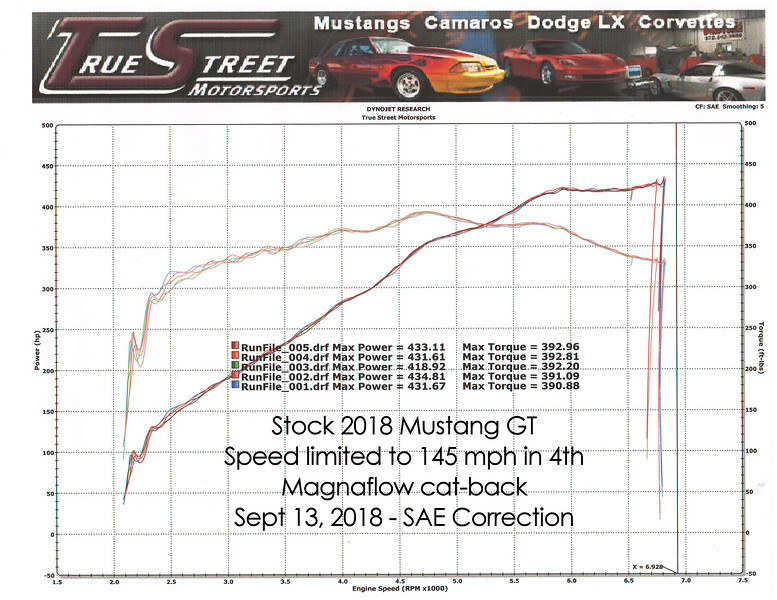 We would have been using 3rd-4th-5th gear here with the 4.09s instead of 2nd-3rd-4th like we had to with the 3.55 rear and the new MT82-D4 trans gearing. Looking at the results I didn't improve in placement (still 6th out of 10) but moved up to 9th overall out of 35 TT competitors, by going to the Hoosiers. That's how far out of the hunt this car is for TT2, and why we are going to great lengths to get back into TT3. On the relatively skinny R7s, we were 500 pounds overweight or 60 whp down from the limits of TT2, and still had no aero. Most of the players in TT2 are winged warriors on stickier Hoosier A7s in wider sizes. 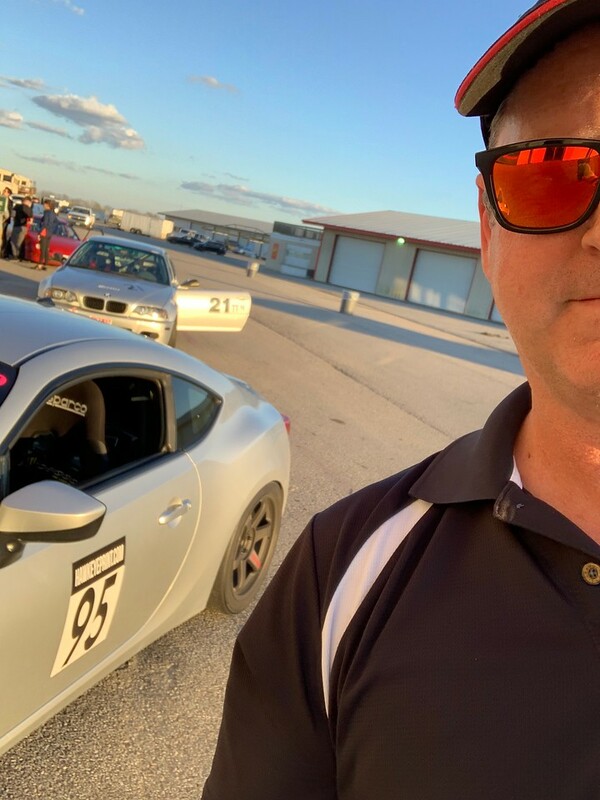 I stuck around to do more instructor duties, as my HPDE1 student moved to HPDE2 (solo). I did a number of check rides on Sunday afternoon, a 2 to 3, a 3 to 4, and a 4 to TT. 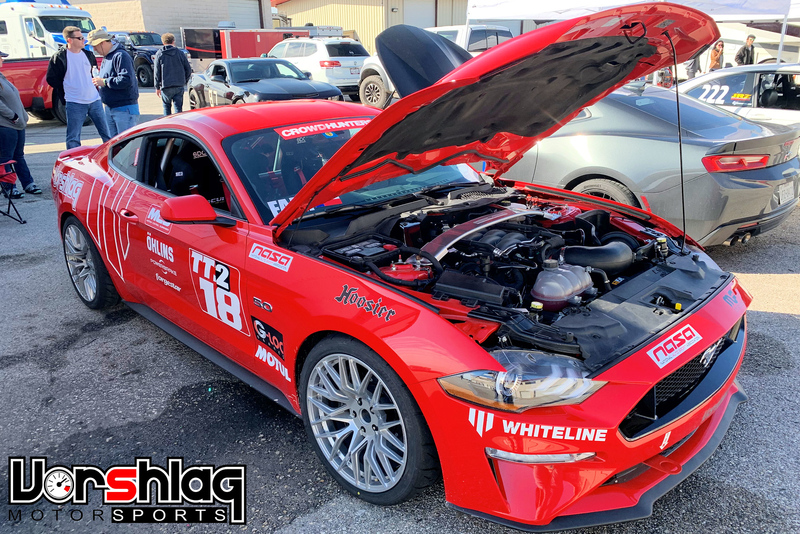 The most fun ride of the day was in the "Alpha" LS swapped 2013 FR-S we built for another customer 3 years ago, now owned by Tyler Starr - who was moving up from HPDE4 to TT. That session was a blast and he more than earned his way into TT! 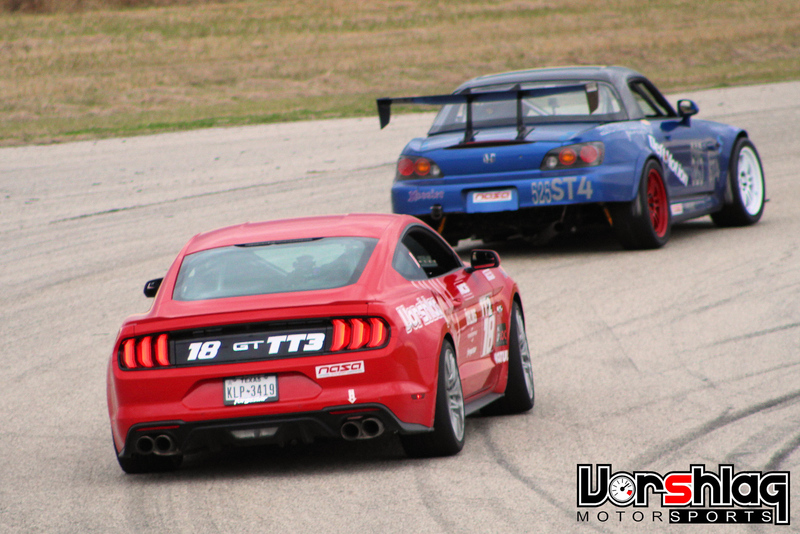 Two months later we were competing head-to-head in TT3 at MSR-Cresson. It was nice seeing a car we "built for track use" being run in Time Trial, and working flawlessly. The radiator and oil cooling we added worked, the gauges we had added were helpful, gearing was spot on, and the custom shifter just falls right into your hand - inches away from the steering wheel. He was having a ball and even hooning a bit, after I encouraged him to "let the car eat". He added aero before he joined us in TT3 at the March event, too! 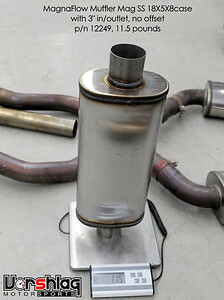 I can't wait to get our shop V8 FR-S completed. 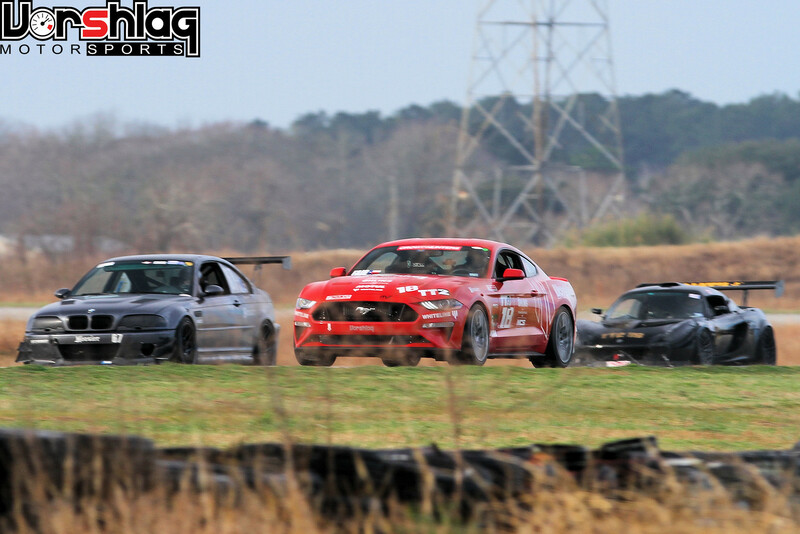 Amy didn't drive this weekend, but she did at the next event in March. We had a few snafus with loading some of our gear, since we just had the trailer refitted and had stripped out all of our stuff. Will get those items added back before the March event. 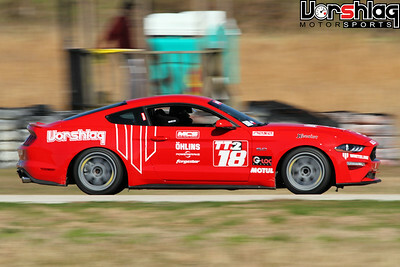 Had a lot of fun - got some sun, some good laps, and saw lots of friends, competitors and customers. Glad we missed the rain, which was looming the week before but only came down Saturday night and did not impact any racing. 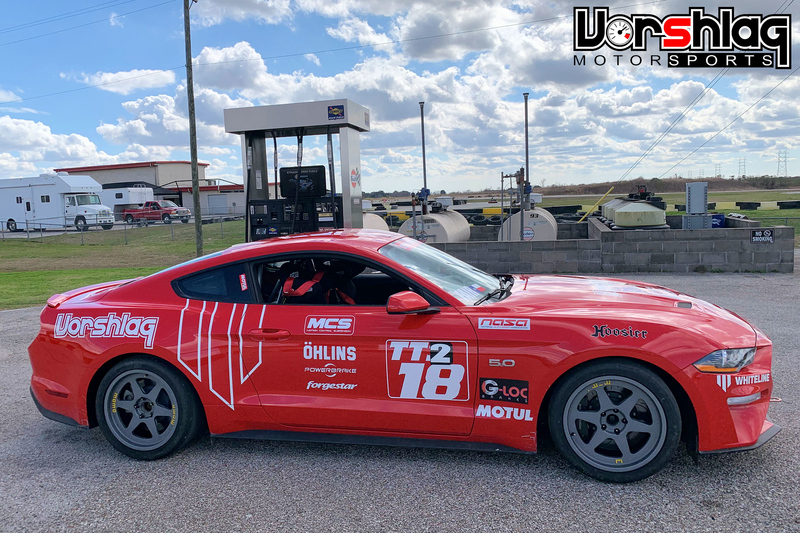 So this is our first back-to-back test of a BRAND NEW set of RE-71R 200 treadwear tires vs BRAND NEW Hoosier R7s (the last test was worn A7s vs worn RE-71Rs). Was this a perfect test? Not quite, no. 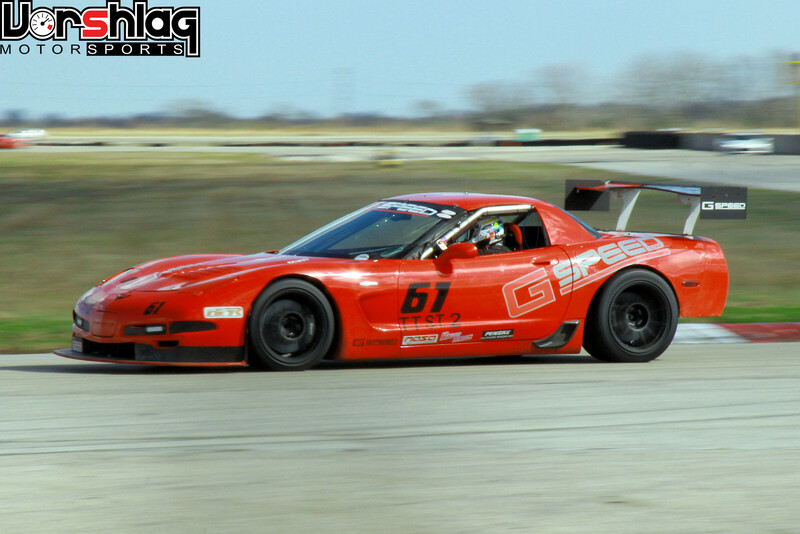 This track is the one I perform the worst at on the entire NASA Texas schedule, and my times on both days were hampered by my driving, increasing track temps and other factors. Neither the street tire or Hoosier tests here managed a lap as good as the predictive lap timer showed was possible. But still, it is another data point. On this 2.38 mile track with the same driver, conditions, and surface, the R7s were 1.139 seconds faster than the RE-71Rs. This is less difference than we thought there would be. Looking at the AiM data min/max numbers, the minimum speed was slightly higher but the top speed was almost identical on the R7s (likely due to some gearing differences). Lateral grip wasn't radically different, 1.32g vs 1.28g on the street tires. But braking is where the Hoosiers seem to jump ahead, 1.16g vs 1.06g on the Bridgestones, and I could feel that ~10% difference. The RE-71R registered a higher "forward" grip level, .49g vs .56g, due to the fact that I was using 2nd gear in one slow corner on the taller RE-71R that just didn't work at all on the R7s (massive wheelspin). This only affected one small segment of that one corner. A change to the 4.09 final gear ratio would make 3rd gear work better in that corner on both tires, I suspect. We have another test of this at the March NASA event, where I ran the same two tires on the same day, and better matched what the predictive timing showed as possible on both tires. 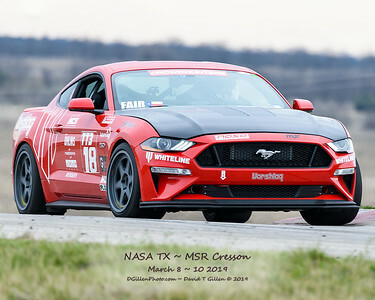 I will continue to do this back-to-back testing at all NASA events all season. Speaking of final gearing, we finally wrapped this up in February! 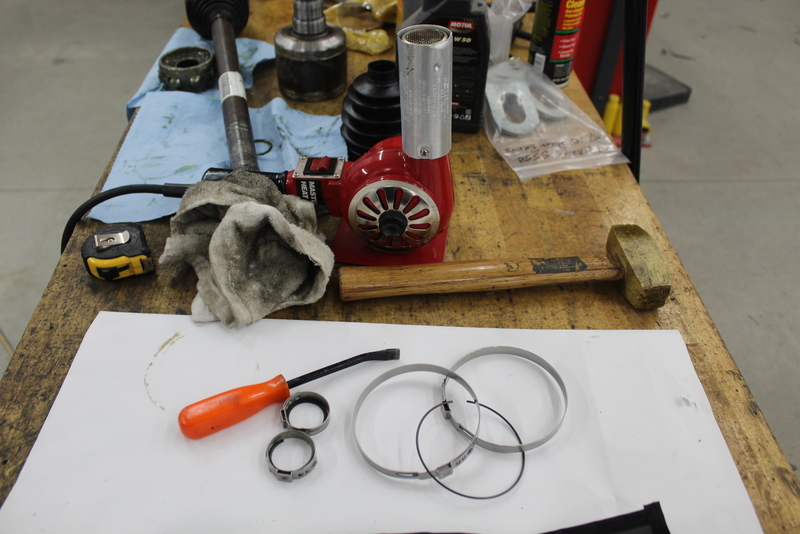 We started this project back in November, analyzing ratios, and then gathering parts. 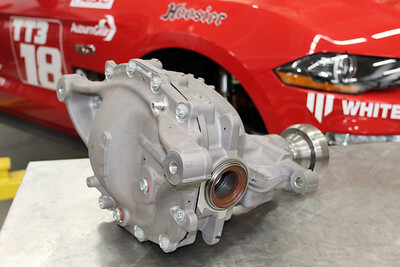 Let's cover the what, why and how of this gearing, differential, and housing change. 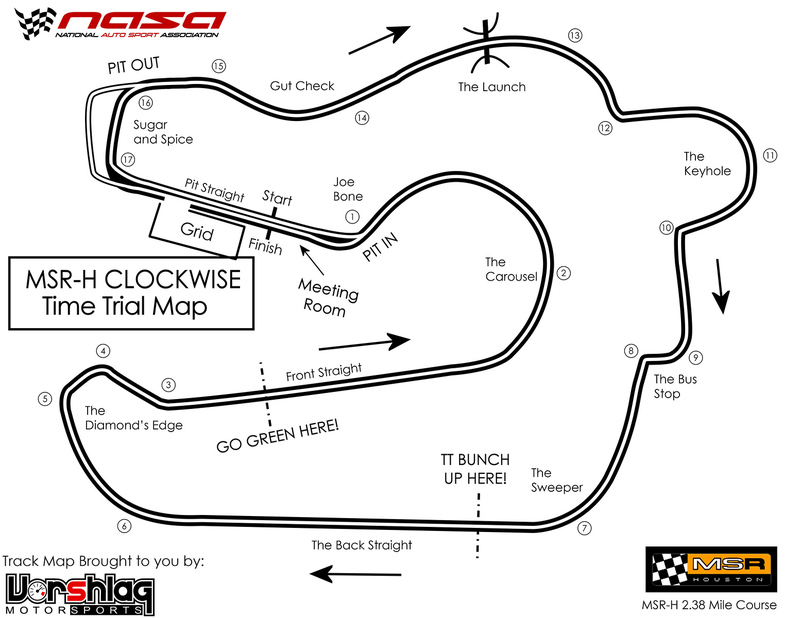 I have run the various Texas /Oklahoma / Louisiana road course tracks in over a dozen of my own cars and customer cars (100+) for the past 3 decades. None logged more laps than my red 2011 GT (shown above) with the old MT82 6-speed manual. 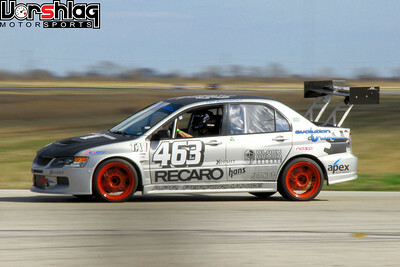 In this car we would use 3rd, 4th and 5th gears on almost all road course tracks, with a 3.31 rear end ratio. This was a good gearing spread that worked at both low speed tracks (125 mph top speed) and higher speed tracks (160+) with the same 3 transmission gears. We never touched 2nd gear on a road course with this setup, yet autocrossing worked great like using 2nd, with a 75 mph top speed. Our current 2018 Mustang GT has a similar 6 speed and a 3.55 rear gear (shown above), but it always feels like I'm in the wrong gear on any road course, everywhere. Why is that? 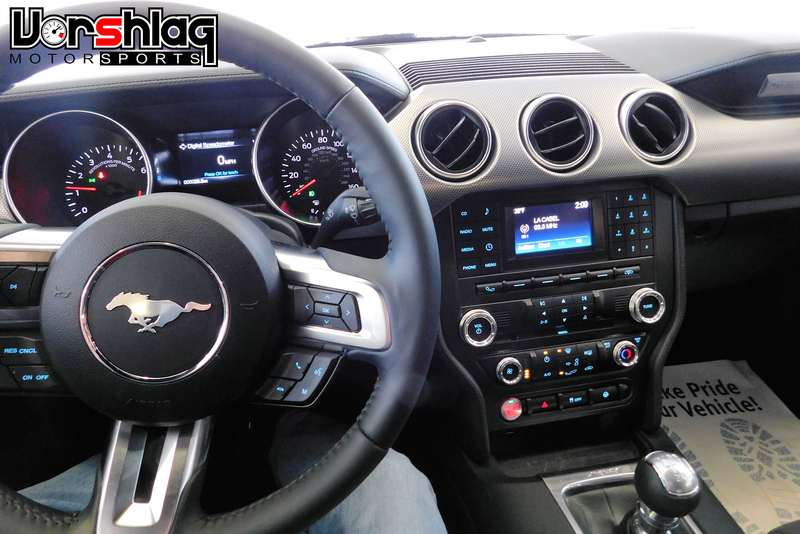 The 2018+ Mustang GT has a revised six speed manual, which has all new transmission ratios, called the MT82-D4. We have talked about this before in this thread, and listed out all of the ratios. The 2011-17 Mustang's MT82 manual had a 1:1 5th gear (plus one overdrive), whereas the MT82-D4 uses a 1:1 in 4th gear (and has 2 overdrives). 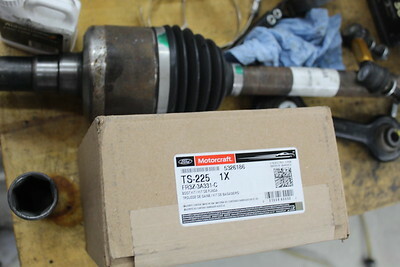 So all of the gears "feel wrong" on track to me, compared to the old MT82 transmission. 2nd gear is too low for slow speed corners (like the T11 at ECR above - I have to upshift to 3rd gear mid-corner) but 3rd is too tall for many slow corners. 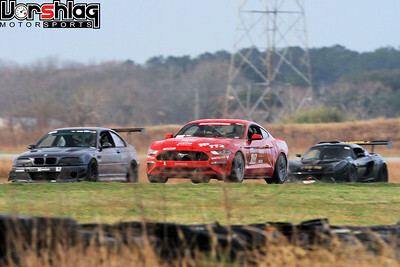 4th gear goes on forever - I can't even use "all of this gear" at big tracks like COTA or NOLA. Have never touched 5th or 6th gear on any track with the new trans -those 2 gears are completely worthless to me with 3.55 rear gearing. 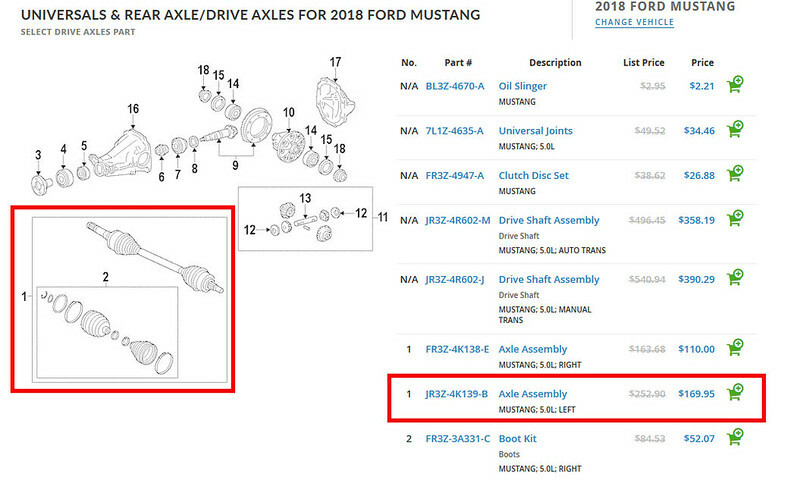 The real issue comes from the fact that Ford offered the exact same final gear ratio options in the 2018-19 cars as the previous MT82 cars... so every gear feels "off" for the 2018+ GTs. 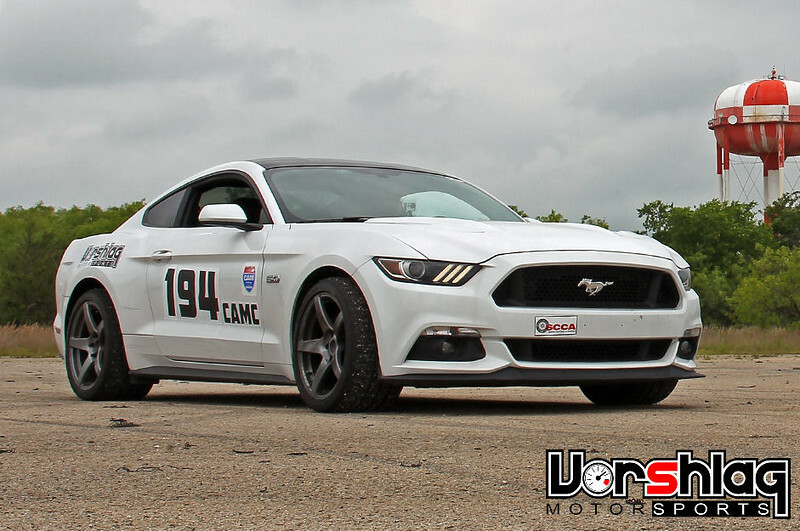 The Shelby GT350 uses a different and better built 6-speed manual called the Tremec 3160, so it was not affected by the MT82-D4 change. 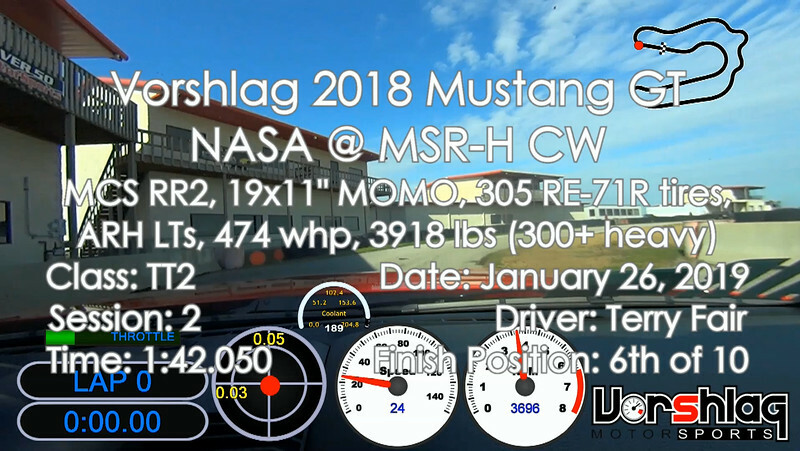 The spreadsheet below has the new MT82-D4 ratios in for 1st through 5th gears, and you can see that with the existing 3.55 rear gearing we have and the two tires we use most, 4th gear goes to 165 mph and 5th gear goes to 203 mph! That's just not practical, making 5th gear totally worthless, so in essence we are giving up usable acceleration in 3rd and 4th gears. Plus 2nd gear is still almost unusable on track - too much torque at the rear tire. Jason made this spreadsheet years ago (we will gladly share it with you) with lots of variables he can change. "Low and high RPM" gives us the spread we want to see speeds for in each gear. We use two different tires so we have two tire heights. 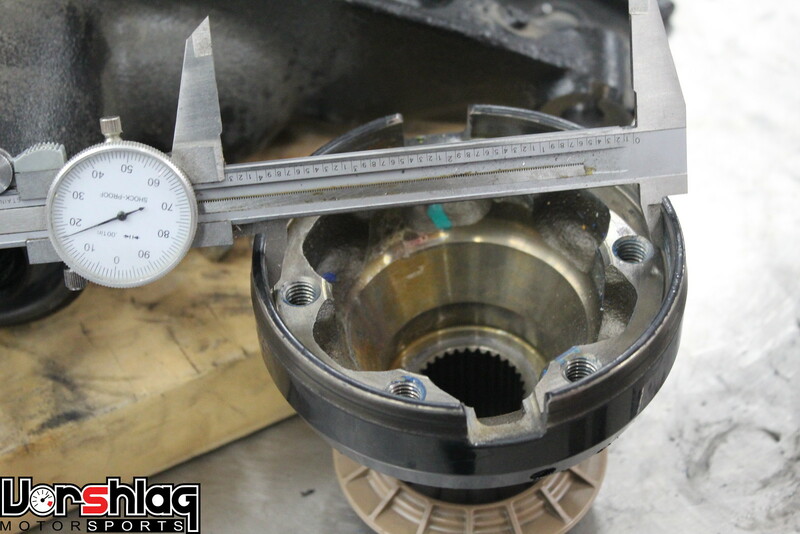 We input 4 different rear rear gear ratios (there are currently only 4 choices for the Super 8.8 at this time). 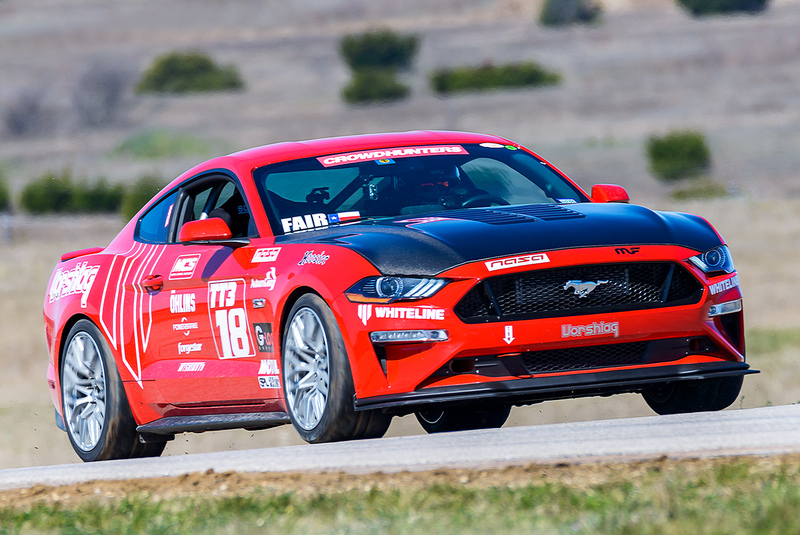 After looking at the transmission / rear gear / tire heights and doing many calculations, we picked a new rear end ratio and ran it by swapping in a new ring-and-pinion. After analyzing the speeds our car is seeing on most tracks, from the slowest corners to the highest speed straights, the Ford Racing 4.09:1 rear gear set (which never came in any OEM Super 8.8 application) looks like it will work the best for our road course needs. That is the lowest ratio offered for the 34 spline Super 8.8 axle, in any case. 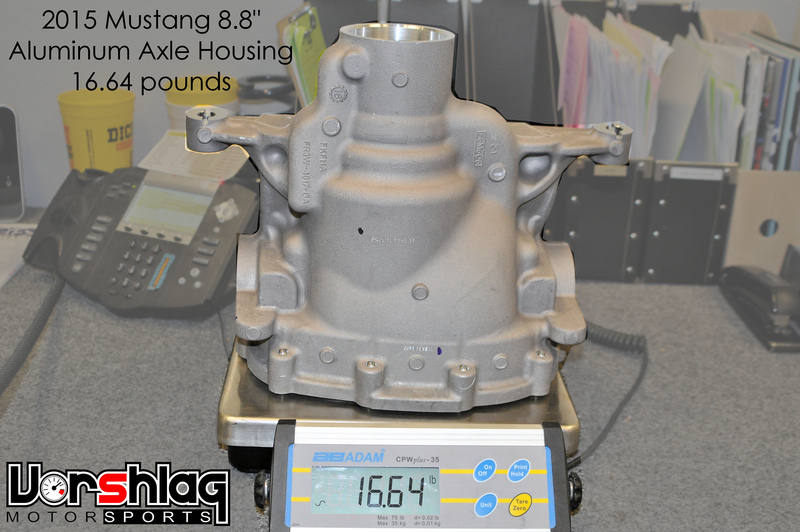 This won't be perfect for autocrossing, as the 4.09 limits 2nd gear to 66 mph (18" Hoosier) or 68 mm (19" RE-71R). 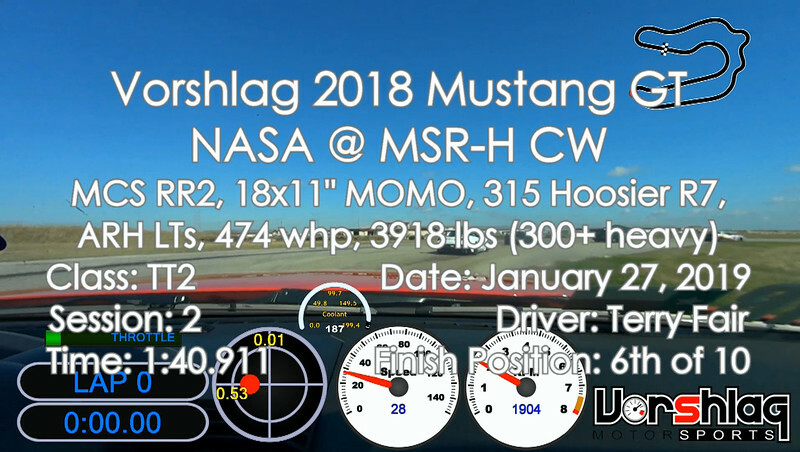 If you have one of these '18-up MT82-D4 cars and autocross is your game, look at the 3.73 ratio 2nd gear speed numbers above. WHAT IS A SUPER 8.8? 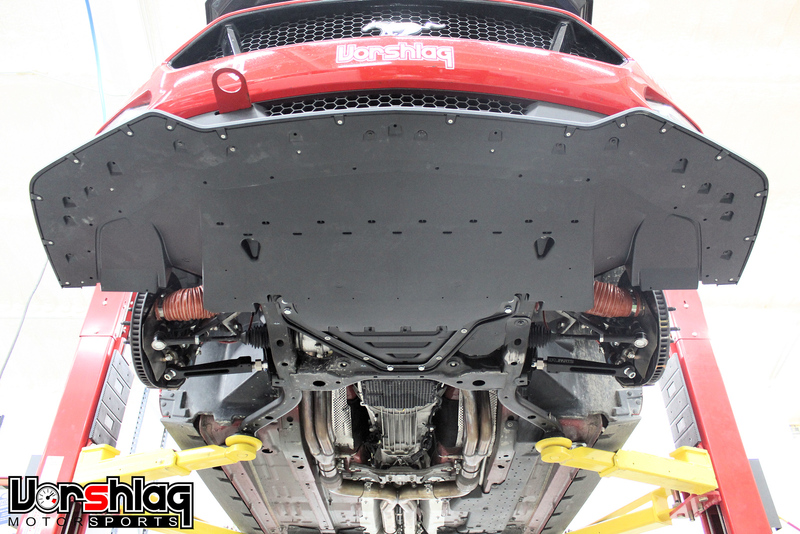 The 2015-up S550 Mustang came with an all new independent rear suspension that utilized a new "Super 8.8" differential housing, in place of the solid axle 8.8" that has been in use in one form or another since 1985. 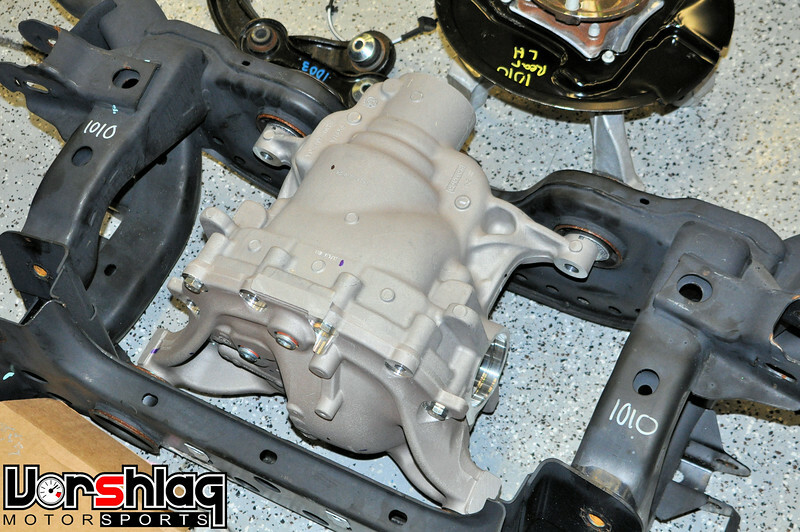 This new Super 8.8 housing comes in two flavors: a cast aluminum version and a cast iron housing (both shown below). 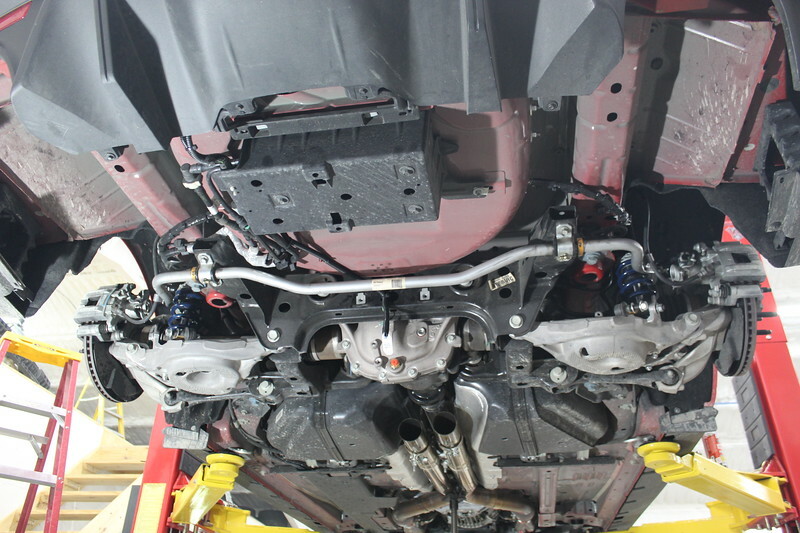 The Shelby GT350 and all 6-speed manual GT's use the iron housing, the rest (automatic equipped GT, all V6 and Ecoboost) use the aluminum housing, which is a tick lighter (more on that later). 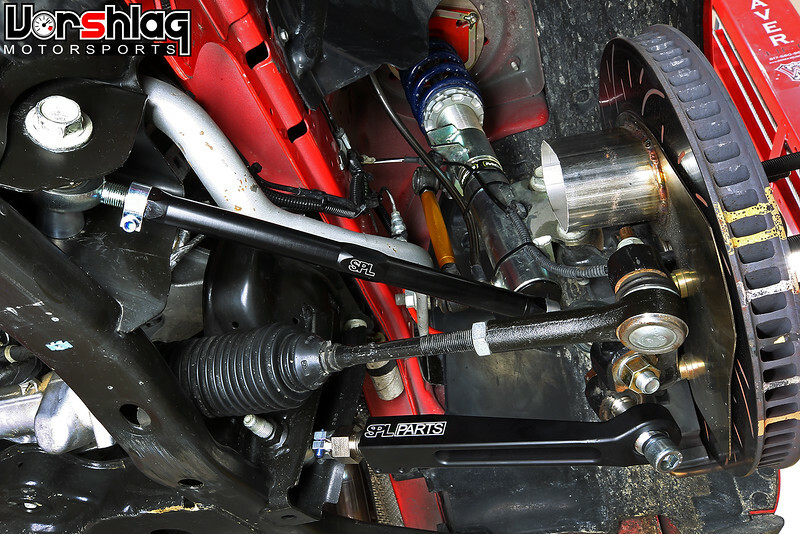 Both Super 8.8 housings bolt into the tubular steel rear suspension S550 subframe (see below) at the same 4 points. 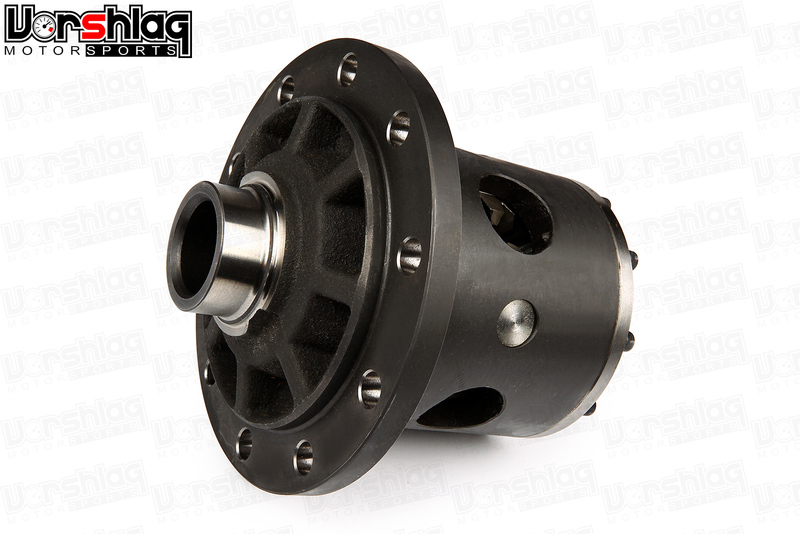 These are built to accept differential housings with 34 spline stubs for the halfshafts (axles), up from 31 splines in the 03-04 Cobra IRS 8.8" housing (the 1999-04 Cobra IRS diff housing looks nothing likes this, and has zero cross-over parts), and is stronger than the 28 spline axles used in the earlier stick axle Mustangs (1985-2006). More splines = stronger. 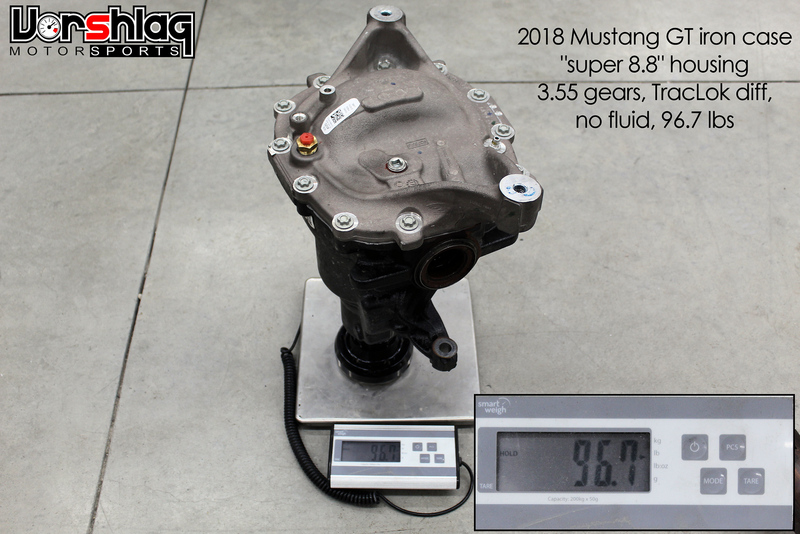 The Super 8.8 uses all new guts (34 spline diff housing + gears + bearings) but luckily Ford Racing makes compatible gear ratios, just in a lot fewer options than the 1985-2014 solid axle 8.8. The Super 8.8 ratios include 3.31, 3.55 and 3.73 from the factory but there is also a 4.09 ratio available (new ratios might exist by now - we did this analysis late last year). We had weighed one of the bare aluminum Super 8.8" housings a couple of years ago when I purchased it for another development project, so when we thought about putting this heavy S550 on a diet (for TT2), this made the most sense. Weights above are ones we took of the bare aluminum housing and cover - we show the complete aluminum super 8.8 housing plus the complete iron unit below. Before the peanut gallery chimes in, I know what you are thinking. "BuT tHe AlUmInUm HoUsInG bReAkS!" No, not really. Of course drag racers can break anything on a good hook, at a prepped drag strip, with axle hop. 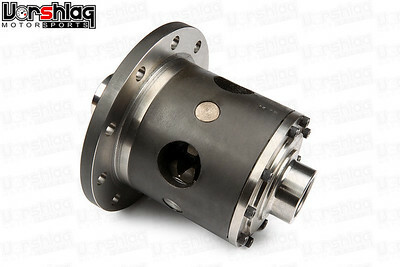 Yet we have spoken to a 900 whp drag racer who vouched for the strength of his aluminum Super 8.8 housing, and the pro road race teams also use these also and don't break them. If we break it, then I will post that data point. We try new things and sometimes they don't work out - but we share that data. 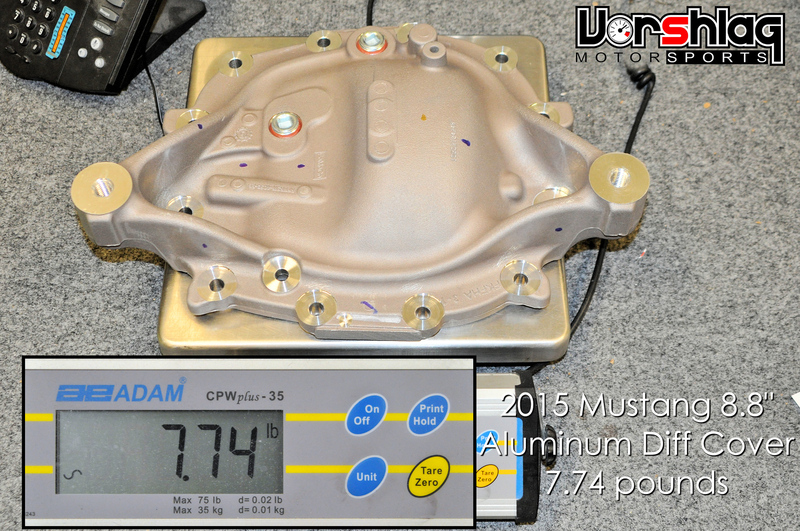 We already have some direct evidence from our S550 OEM camber plate tester's car, above (Brian M), who used one of these aluminum Super 8.8 housings with a Torsen T-2R that he built up in his 2015 Mustang GT 6-speed manual over 3 years ago, and its still holding strong. 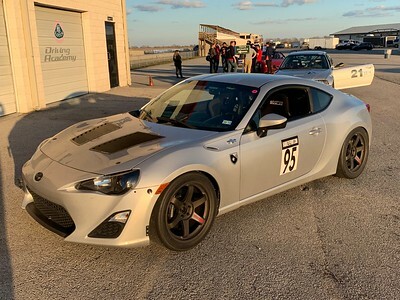 This car now spends time every week on track at MSR-Houston with the new owner Matt (now on MCS TT1s), running on sticky 315mm tires, turning fast laps. 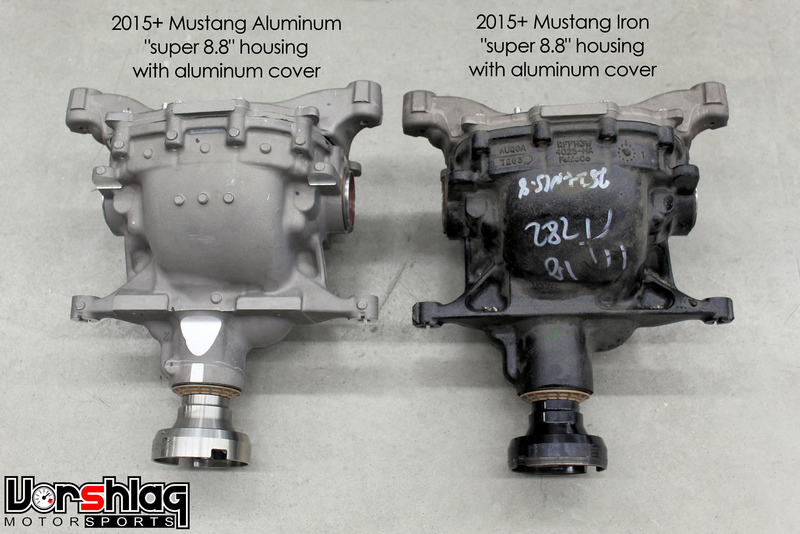 Again - all 2015-17 5.0L automatic GT's got the aluminum housing, so its not exactly unproven. 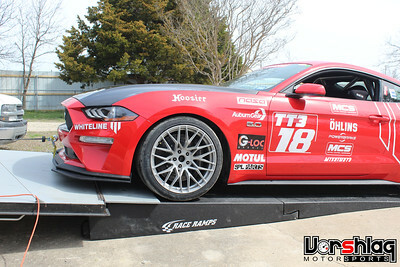 The 2015-up Performance Pack GT and 2016-up GT350 models got a Torsen style differential, which is helical geared unit that "does not wear" and does not rely on clutches to have a limited slip action. 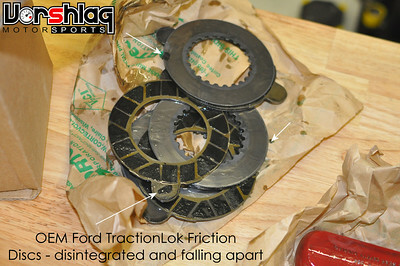 Of course the cheap base model GT like our's came with the old "clutch style" differential unit Ford calls the Traction Lok. These are universally loathed and it was showing signs of wear AFTER OUR FIRST TRACK WEEKEND. Our car essentially has had an open differential since March of 2018. 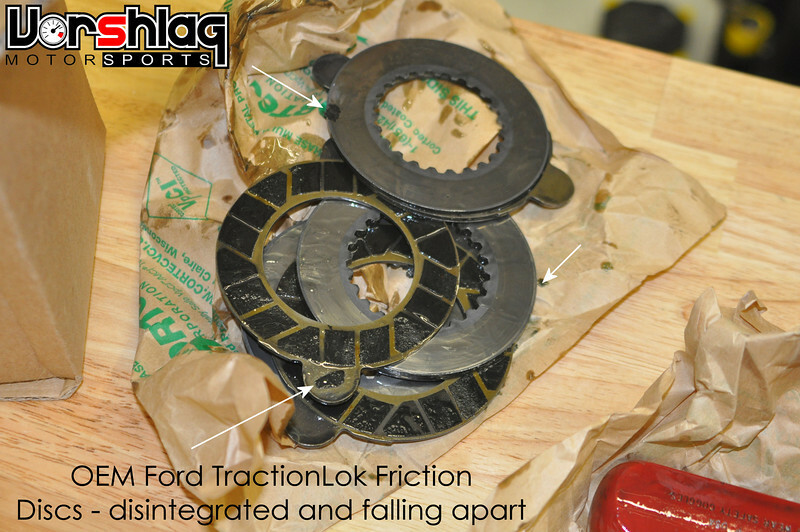 We regularly destroyed these clutch packs (even the upgraded Ford Racing carbon packs) in our S197 before moving to a Torsen T2-R... they would last one or two days before the differential needed to be rebuilt again (see above). The T2-R was a non-wearing, performance upgrade in that car. 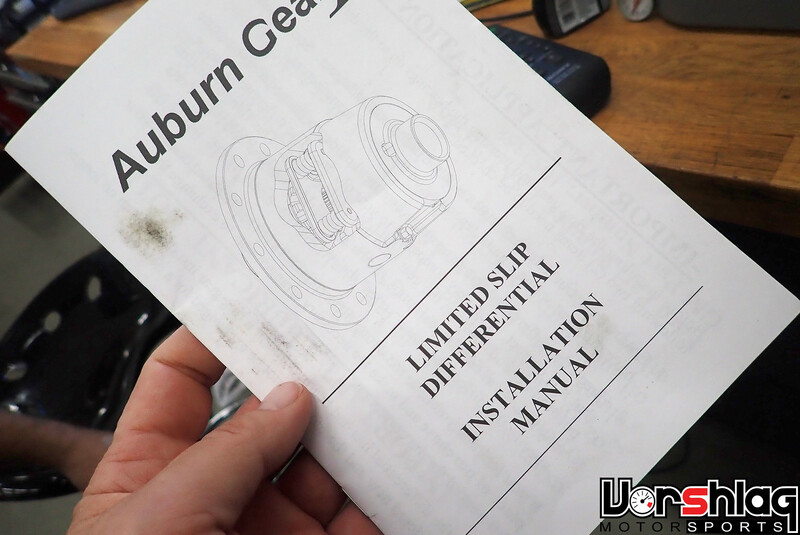 This build thread gets around, and Auburn found out we were going to be testing a new diff. 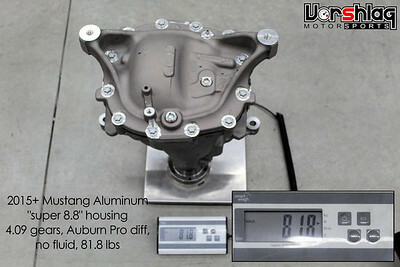 We talked, and shortly after Auburn sent us a new prototype Auburn Pro diff for the Super 8.8" housing. 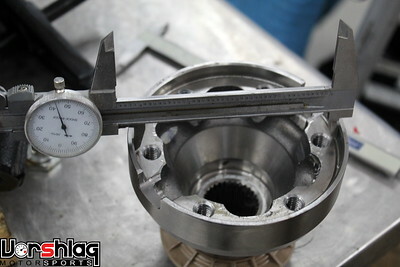 We will put in some test laps to help get their prototype Super 8.8 unit proven and ready for production. 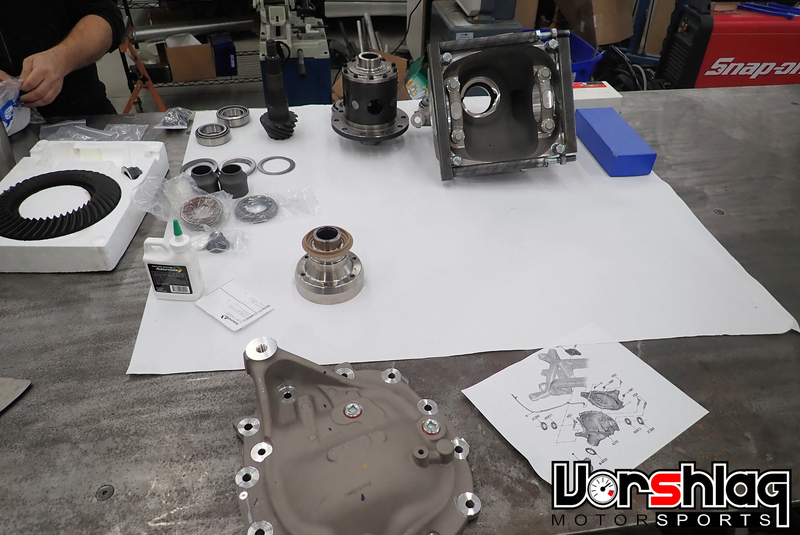 After we gathered the new Auburn Pro diff, the aluminum housing, cover, new 4.09 gear set, new bearings, pinion flange, plus all the seals and shims it was time to build a new Super 8.8 assembly from scratch. 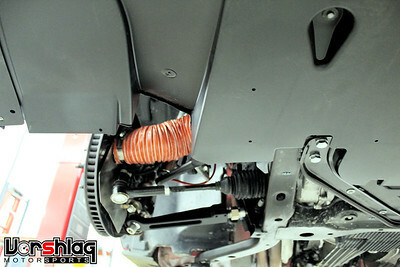 First, we needed to modify the new cover for our aftermarket diff temp sensor. 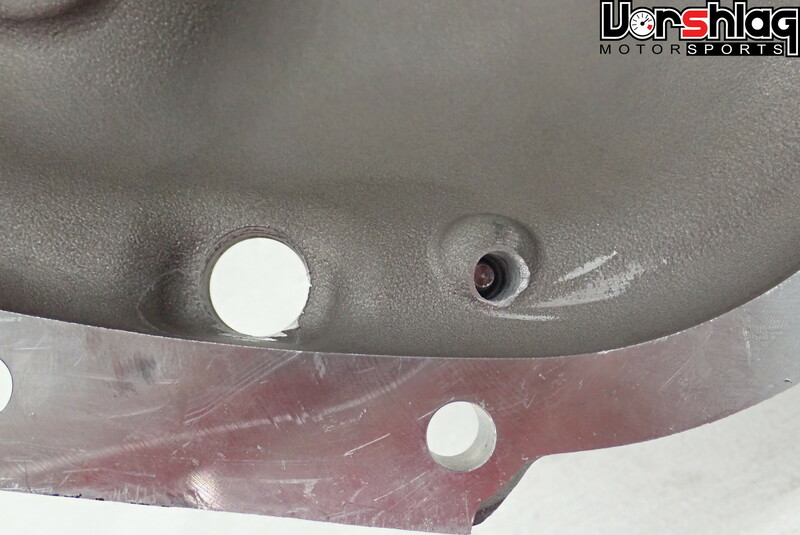 The original rear housing cover on our 2018 GT had a BLIND threaded hole that looked like a perfect diff temp sensor location (between the fill and drain plugs), but since it was blind the hole had no direct access to the diff fluid. We had purchased an extra rear cover, since we need a complete Super 8.8 for another project we are working on. The new cover was slightly different - it only had a "cast" blind hole, no threads, but still looked perfect for a differential temp sensor location. 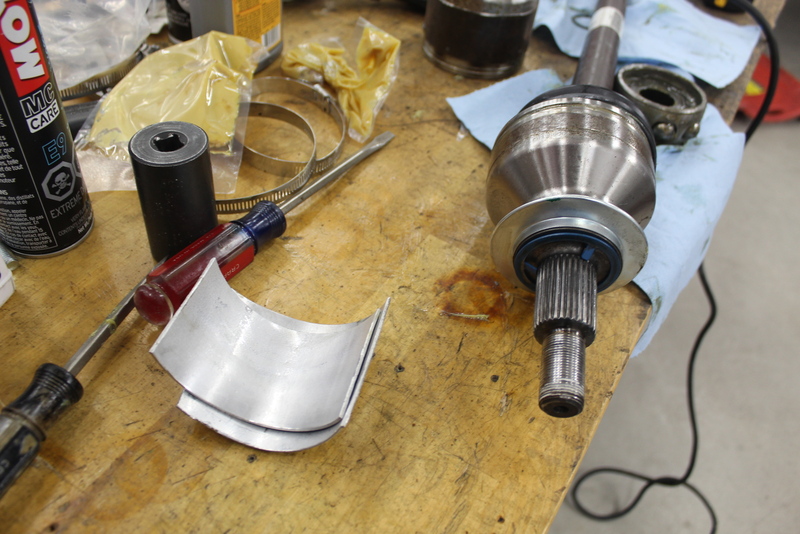 We drilled and tapped that cast hole for 1/8" NPT threads, and fit the external diff sensor - and it can touch fluid. 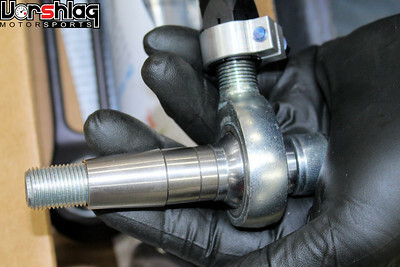 On the previous setup we had made an adapter to mount this sensor in the threaded hole for the lower drain plug in the housing (see this image). 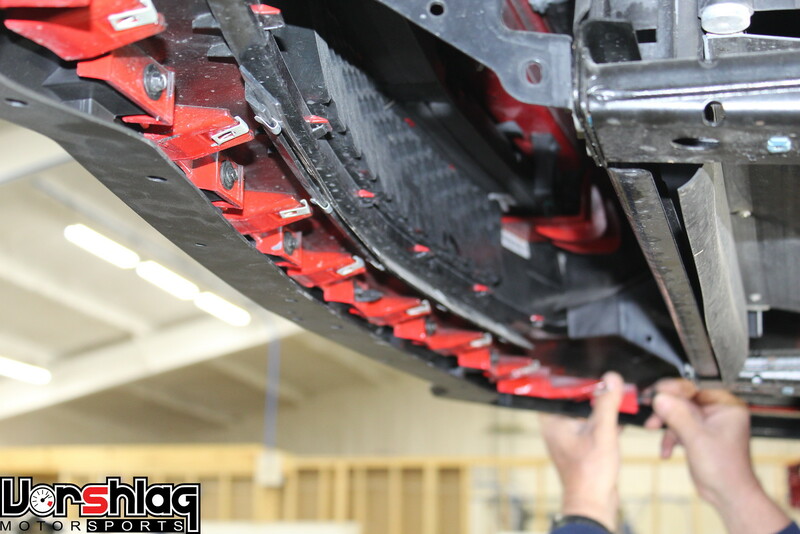 After reading some of the small amount of tech we could find about installing a new differential and gears into a Super 8.8, we found we would need a "spreader tool". This tool can be used to help install the pre-loaded diff bearings and shims, so we built this. We built something similar for the SN99 aluminum IRS 8.8" housing we used in a customers V8 BMW. Now we were ready, right? We looked for instructions and torque specs for assembling a Super 8.8 from scratch. There wasn't much out there, so I called up one of my old employees - who used to free lance doing gear swaps for us for many years. 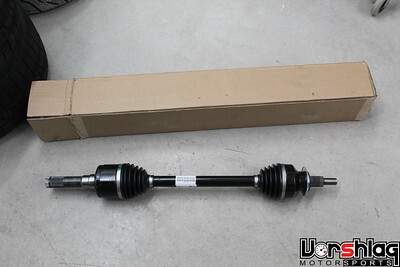 He came by the shop in late February to put this Super 8.8 together. Pinion Nut = Has no set torque value?! 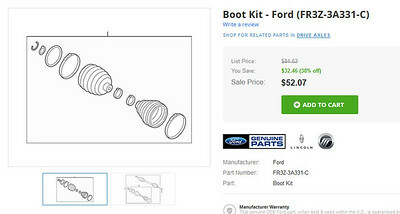 + Ford says to "measure the removal torque and replicate on re-installation"
Ring Gear Bolts = 100 lb-ft "Use new bolts with pre-applied thread locker"
Donnie was familiar with setting and checking the gear wear pattern, back lash, bearing installs, and torque settings. The wear pattern on the ring gear marking paint looked good, then Donnie buttoned up his work. 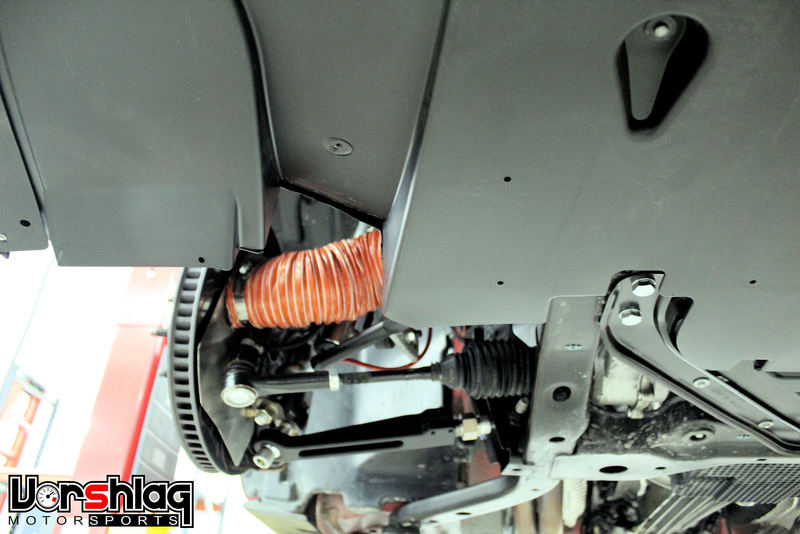 The rear cover went on with a thin line of RTV sealant and new Ford hardware bolted the cover to the housing. 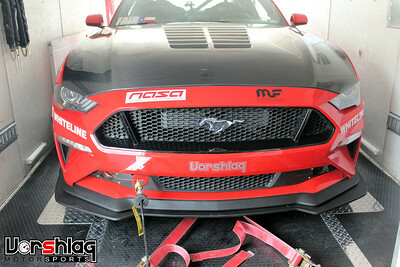 We filled it with Motul Gear 300 along with the friction modifier supplied by Auburn. After driving it and listening for noise on decel, backlash, etc - its dead silent, perfect. One of the small goals was to possibly reduce some mass. 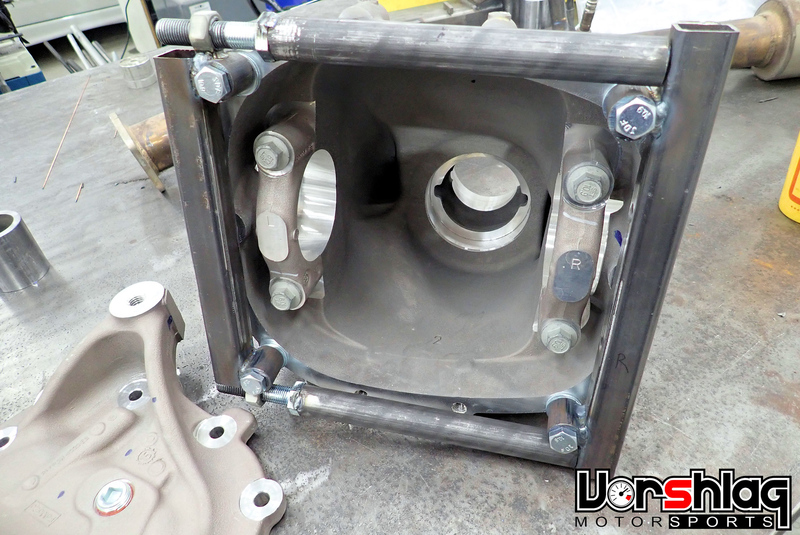 We had heard rumors that the aluminum housing is "30 pounds lighter" than the iron unit. We had weights on the bare aluminum housing, but not the iron. During the install for the new aluminum unit we weighed them both, and the difference in weight was less than we had been told. As you can see the weight difference was closer to 15 pounds - but we have a bit of apples to oranges comparison here. The Auburn Pro diff is built differently and could account for some of the weight difference. Still, its 15 pounds less mass that we need to haul around, and if we move to TT2 for good we will need every pound we can find. If we see any adverse wear or cracks in this lighter aluminum housing, we will share that here. CHANGING THE FRONT PINION FLANGE? We had an extra step we hadn't anticipated here. When the new pinion flange was mated up to the driveshaft... it didn't fit. The ID of the flange was different and the 6 driveshaft bolts wouldn't line up. 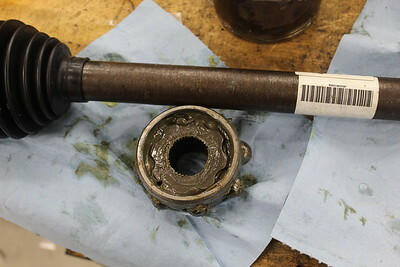 Apparently there has been some change to the Super 8.8 driveshaft rear CV joint and pinion flange. We figured this out after the unit was in the car and ready to button up, of course. The "black" unit on the left was the one that came on our base 2018 GT. 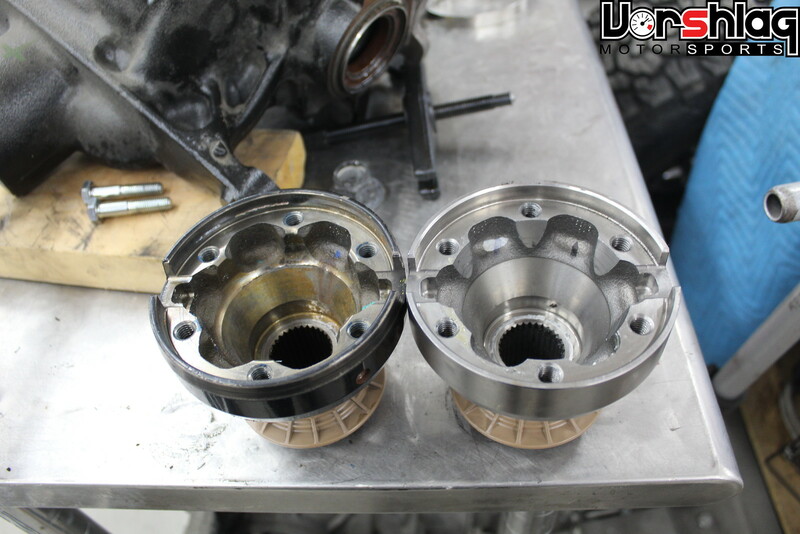 The "silver" pinion flange on the right was the one we bought, when we looked up a similar model S550 housing. 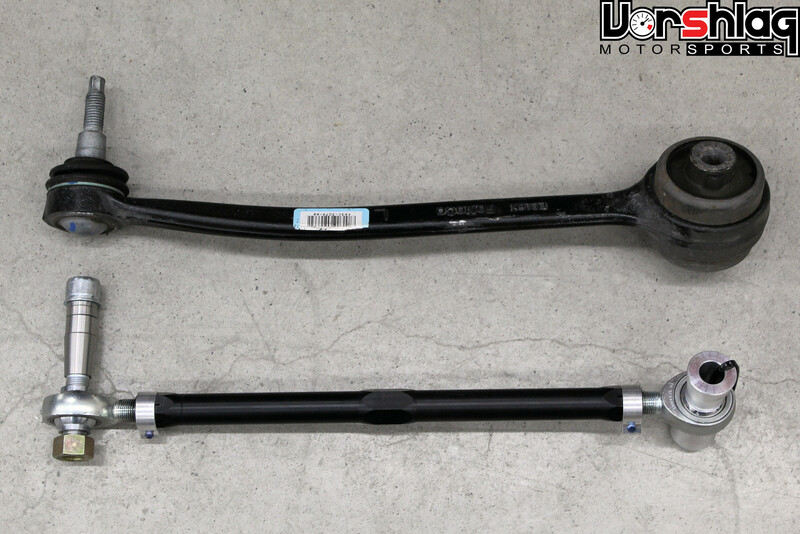 The inner diameter differs by (4.316" black to 4.443" silver), and the 6 driveshaft attachment bolt holes are on different bolt circle as well. We pulled the flange off of the base GT axle assembly and swapped it in place for the new aluminum unit. Installation is relatively straight forward, but not exactly easy. We had the rear exhaust out of the way for a muffler change, and it helped to have this extra access. Next you disconnect the axle at the diff, then go to the rear uprights. 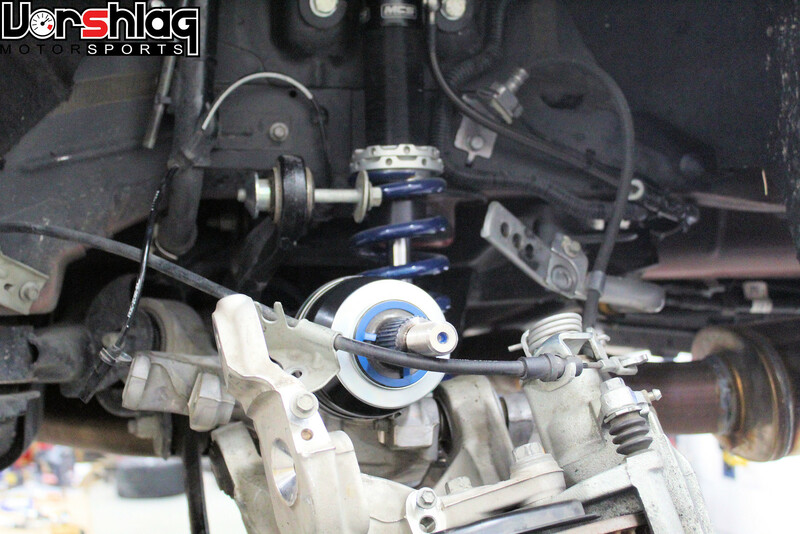 Undo the upper mounting bolts at the upright and let them dangle on the lower mounting points, which allows lateral room for you to "pop" the rear axles out of the diff housing. 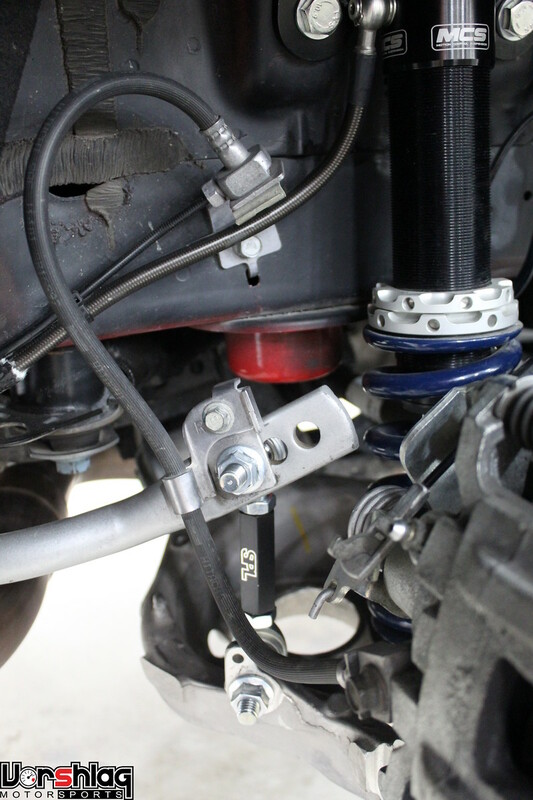 Then secure the diff housing with a trans jack and partially drop the subframe - loosen the front two mounts and remove the bolts from the other two, then drop the rear down. This lets the rear cover of the housing clear the back of the car and come out. Installation is the reverse of this. 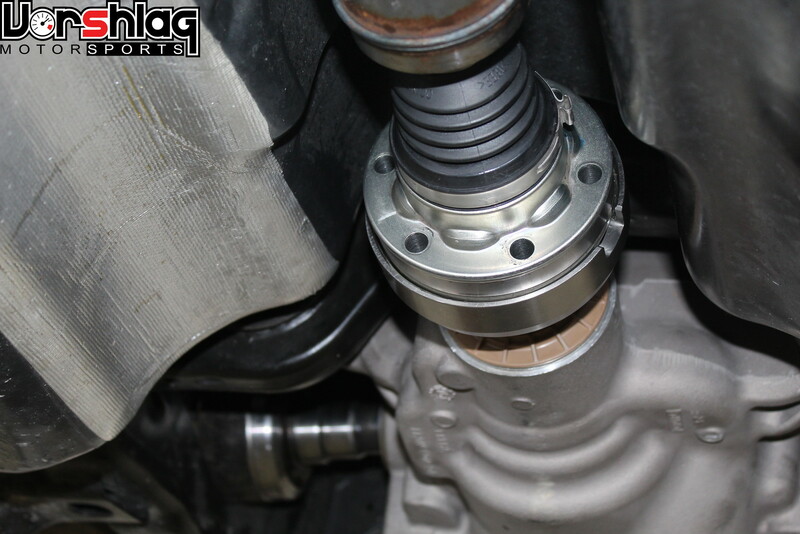 We did this twice, as we found the diff flange issue buttoning up to the driveshaft the first time. Fun. 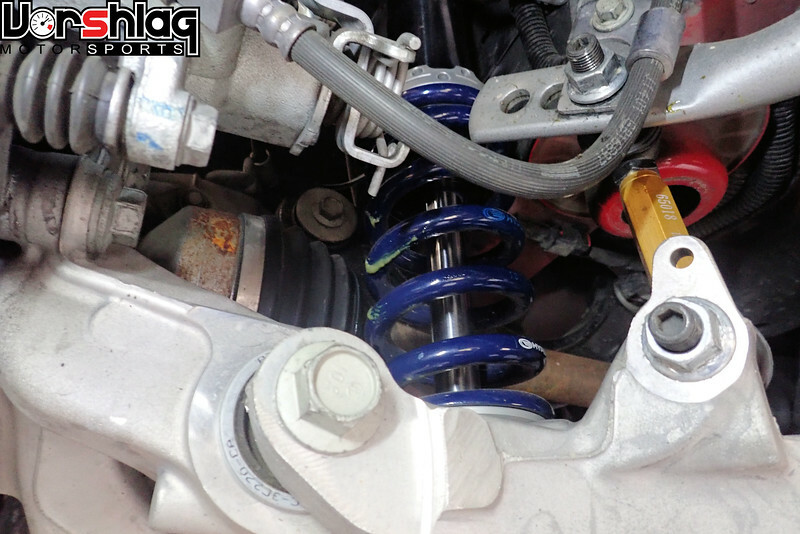 We have had 5 different rear shock setups on this car in the last year, including the inverted Whiteline/AST coilover units (once) and the inverted MCS coilover rears (twice). 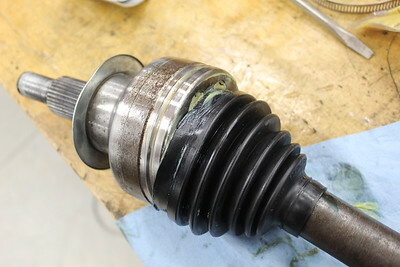 One time we must have had the shock and spring slide a hair too close to the right rear CV boot on the outer part of the halfshaft, and it nicked it... a little grease was starting to come out, so I pushed to repair this boot before it lost all of the grease and failed. I was busy doing something and checked in on Evan and Brad,who were fighting this new CV boot. They had made a pair of "spreader" tools, tried the heat gun, but nothing worked. This CV boot would not go on. PRO TIP: DO NOT EVER TRY TO REPLACE A REAR CV BOOT ON AN S550! JUST BUY A NEW HALF SHAFT. The additional labor of replacing a CV boot is more than enough to offset the difference in cost on the parts. Now that we have engine oil temps under control (never see more than 220F now, used to touch 300+ when it went "into the red") we can make more than 3 laps in a session. The Mishimoto oil cooler was a life saver there. The differential fluid temps shown below are from the the January 2019 NASA event are still a bit frightening. The diff temp gauge only goes from 100 to 250°F, but often "sits on the peg" after 4 or 5 laps, so we don't know really how hot it is getting. 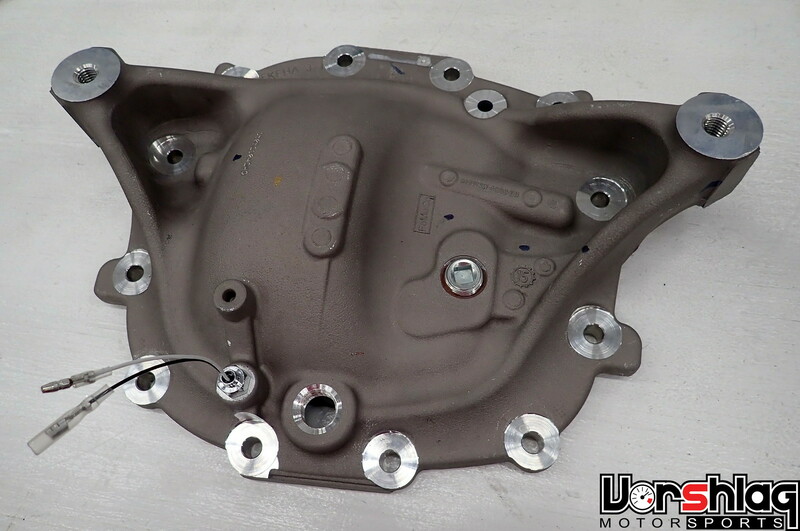 We will see if this aluminum housing can shed heat better than the iron housing, but I suspect we will see a diff fluid cooler in the future on this car. With the rear axle built with the new gearing, housing and Auburn Pro diff, plus the drive flange and right rear axle replacement, we could move on to some other upgrades. 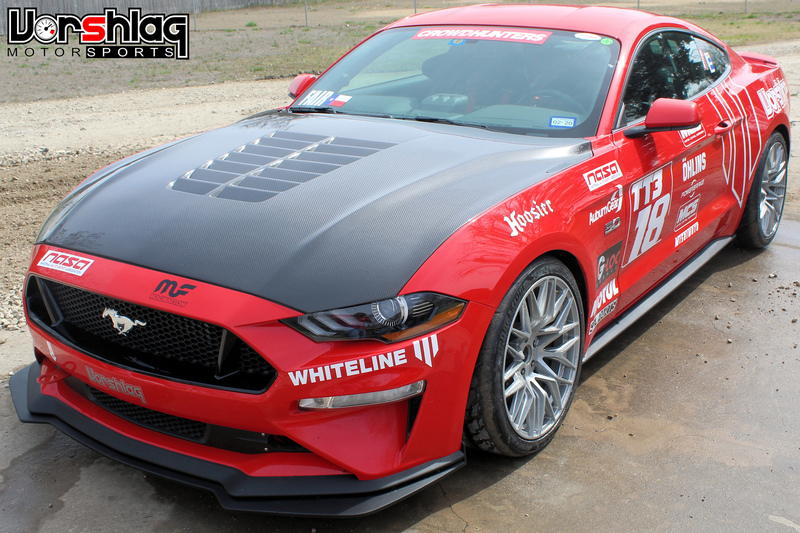 We ordered this shiny carbon fiber hood from Anderson Composites in January and it arrived (along with a GT350R replica rear wing we will install later) after we got back from the MSR-H NASA event. 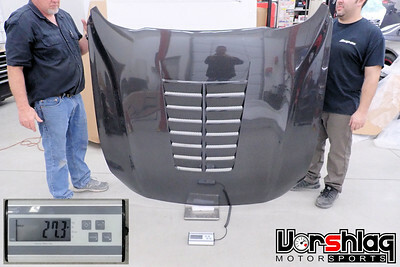 These double-sided hoods are real carbon-fiber replicas of 2020 Mustang Shelby GT500, with fully functional hood vents. These will work with factory hinges and latches. 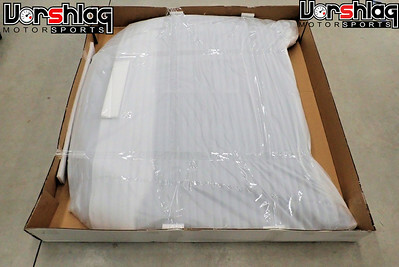 This was shipped via freight truck and was very well wrapped in foam inside of a big shipping box. 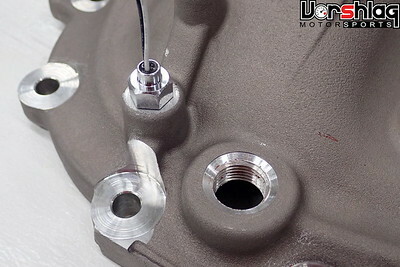 The hood was bolted into the box via the threaded mounting bosses. 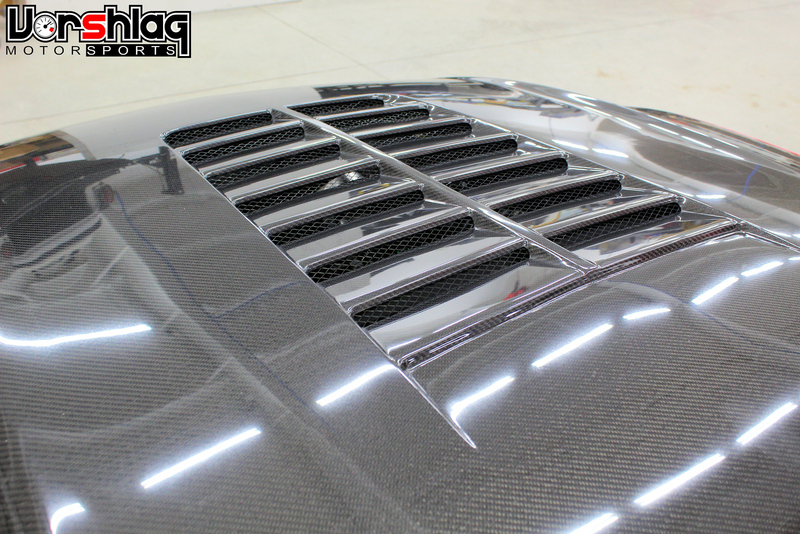 This is a double-sided carbon fiber hood, no fiberglass, with a glossy gel coat to give it some UV protection. We plan on painting this but not for a few months. 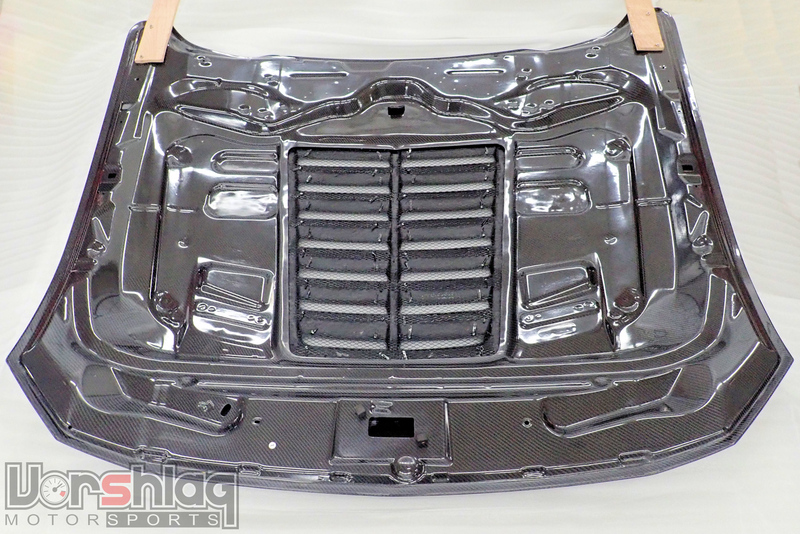 We weighed the stock aluminum hood at 41.2 pounds on our 2018 GT and this carbon hood weighs only 27.3 pounds. That gives us a 14 pound weight savings without any of the compromises of a Motorsports level dry carbon hood (which has to use hood pins and must be clear coated, painted, or wrapped). The glossy gel coat looks good, is super smooth, and should withstand the elements - but a clear coat or layer of paint never hurts. 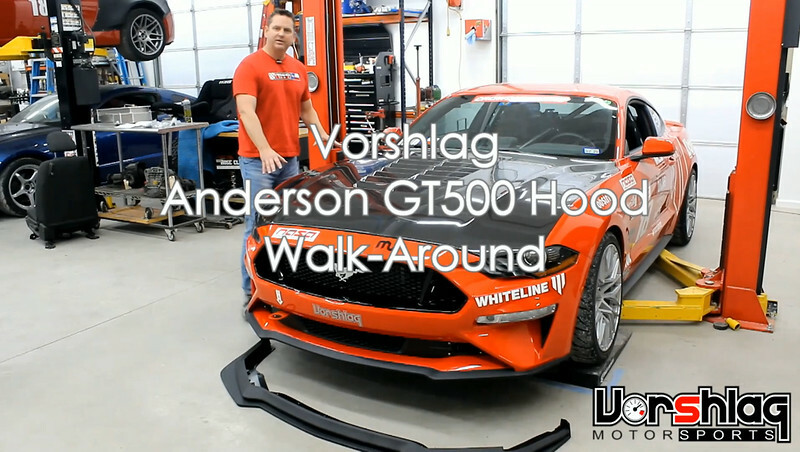 This carbon hood has a fully-finished underside layer with enough structure in place to mount the factory hood hinges, latch, and prop rod - but Anderson recommends not using any aftermarket lift struts. This hood features a large 19 x 26-inch louvered vent totaling 3.43 square feet for heat extraction and reduced front end lift. We have both the 2015-17 and 2018-19 versions of this "GT5" hood listed on our website. The video above is a quick walk-around showing the fit and finish of this hood, and how it was installed. We spent 30 minutes bolting this on and tweaking body gaps - no joke. 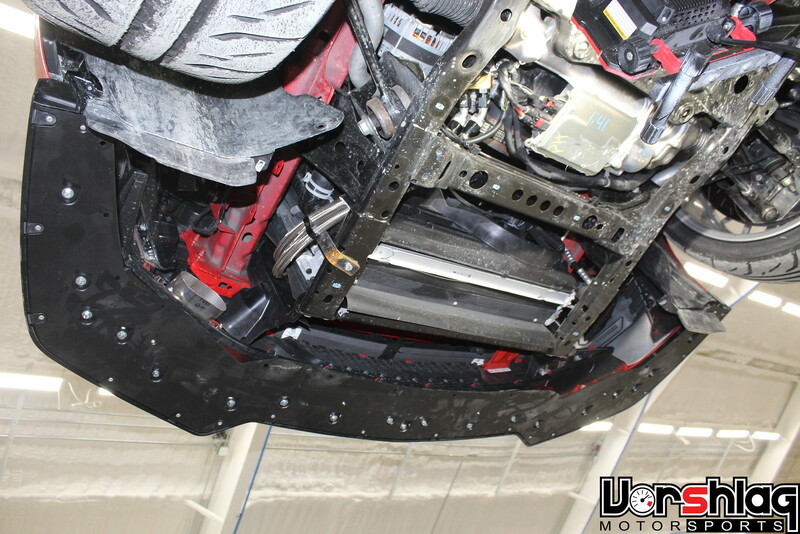 So much easier than the 8-12 hours of bodywork most aftermarket composite hoods for these cars need to be installed. 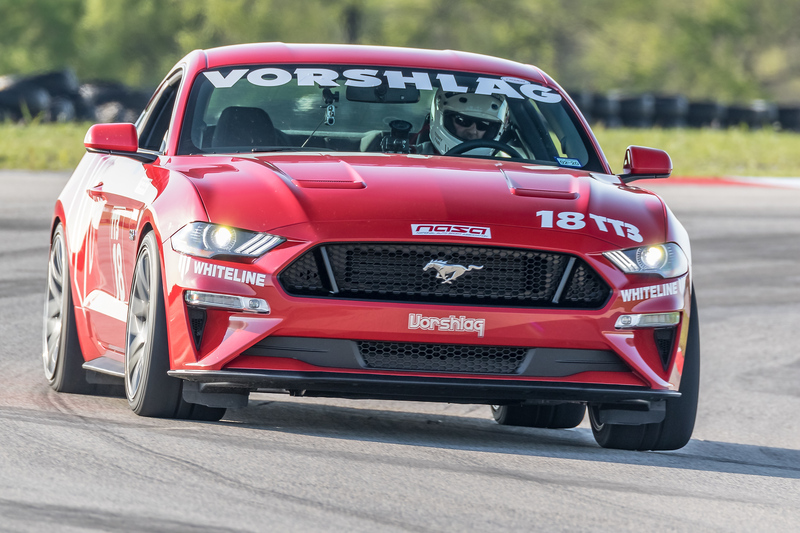 As I have said many times before, our base model GT is missing many of the performance tweaks that come on the Performance Pack 1 or PP2 optioned Mustangs. Radiator, Torsen, 15" brakes, and on and on. Well we found another thing that was missing - the slightly larger PP1 lower lip. 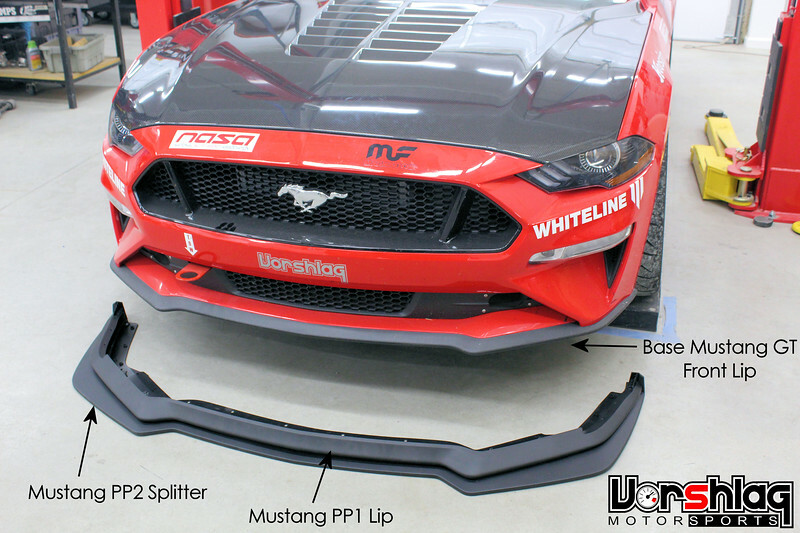 As we investigated what it would take to install the PP2 "extended splitter" we found that we needed to order the PP1 lower lip, among other parts. 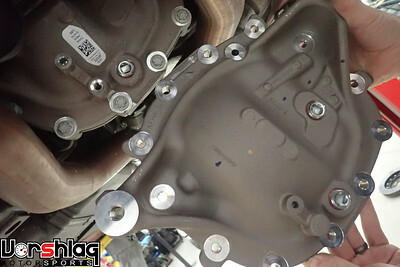 We had seen many forum posts as to what the 2018-19 GT PP2 splitter required and found all sorts of parts numbers, many of which were wrong or incomplete. 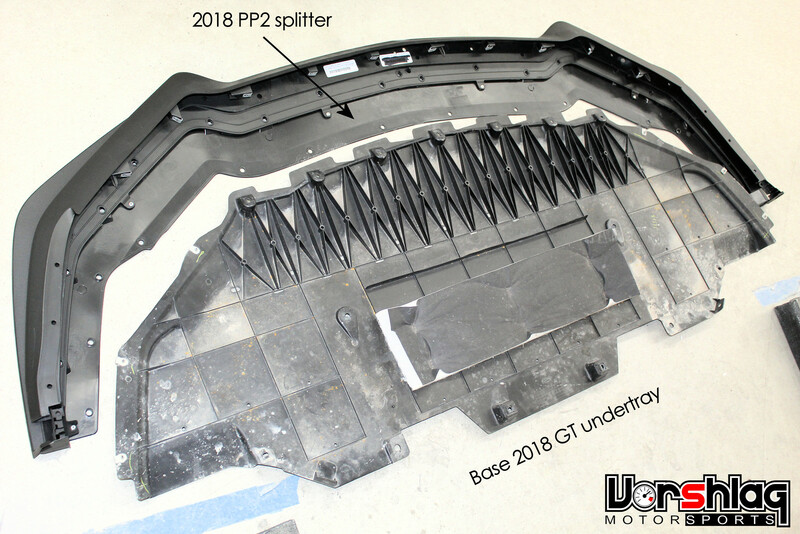 We noticed that the base GT undertray would not line up with the PP2 "splitter", so we ordered the PP2 undertray next plus a bunch of new hardware. This PP2 "splitter" piece is supposed to go on with plastic rivets, but we used nuts and bolts instead, to make it easier to remove later (which we might do if we have a "TT2" splitter). Next the PP undertray was installed, but then we noticed more parts that were different. This "rear" section of undertray no longer lined up from the base car, so this steel brace and a completely different shape rear panel was ordered. The various hardware we ordered earlier all finally arrived and all of the PP1 and PP2 parts from 6 different orders (including some mistakenly ordered parts we sent back) were finally secured properly. Whew! This work shown took place over several weeks, of course. This is what the undertray and PP2 splitter looks like in all its glory. 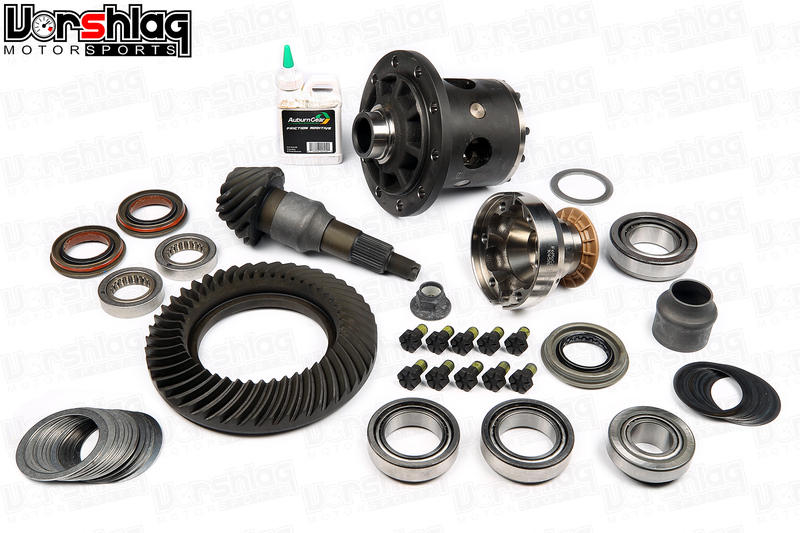 We might offer all of this as a kit for other base model 2018-19 GTs - it took a lotof research and trial and error to get these parts that worked together. Brad noticed that the molded in "tunnels" in the flat PP undertray piece did not line up with the base GT fender liners. 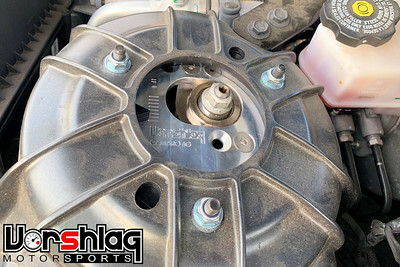 That is because the base GT had the goofy INVERTED HAT FRONT ROTORS, which cannot flow any air through them to cool for track use. 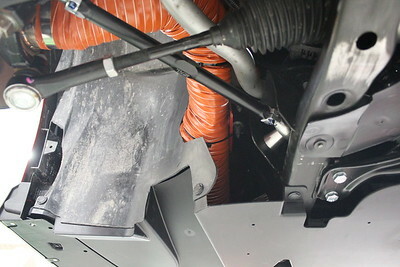 He trimmed the plastic fender liners to fit with the tunnels, which can now route air to the front brakes. 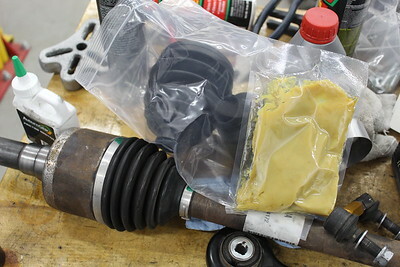 This is a key upgrade because we want to test a new brake cooling technique that doesn't use any hoses. 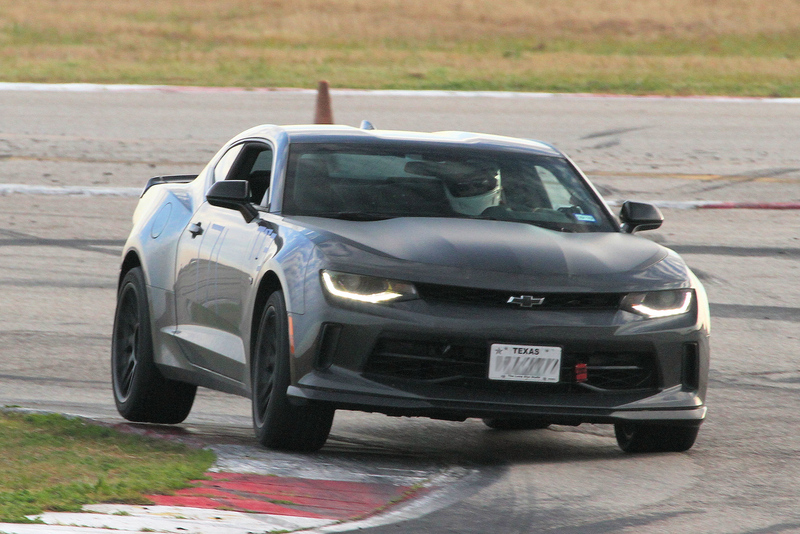 More on that side-by-side track test and data in a later post. Last but not least, you can see the newly replaced 4" brake duct hoses that went in after the failed experiment with 4" oval stainless sections, which were removed. Sure, the hoses get a bit squeezed a small amount at full steering lock with 11" wide front wheels, but it just "is what it is" for now. The stainless tubes restricted steering so badly that one ripped off the car. I'm happy with how this turned out, just wish it would have been easier to piece this PP2 splitter/undertray package together. 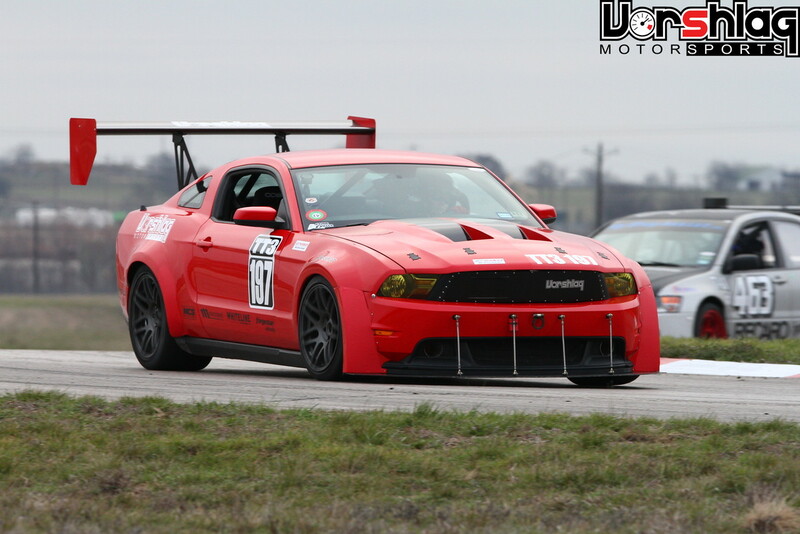 This will be our front aero for classes that restrict splitter sizes or only allow "OEM option packages", like SCCA CAM-C or Optima GT class - both of which are on our schedule for later this year. Of course this is still a bunch of plastic, and won't offer a lot of real front downforce. I'm hoping the GT500 style vented hood will help this PP2 stuff make more than the "24 pounds of downforce" Ford claims. The lower plane of the PP2 splitter is still way too high off the ground - we barely need any ramp to get the car in the trailer. Look for a longer, more substantial, reinforced "real" front splitter later this season for TT2 use. This car might not ever make the power-to-weight limit for TT2, but we're damn sure going to make some proper aero to try to close the gap! 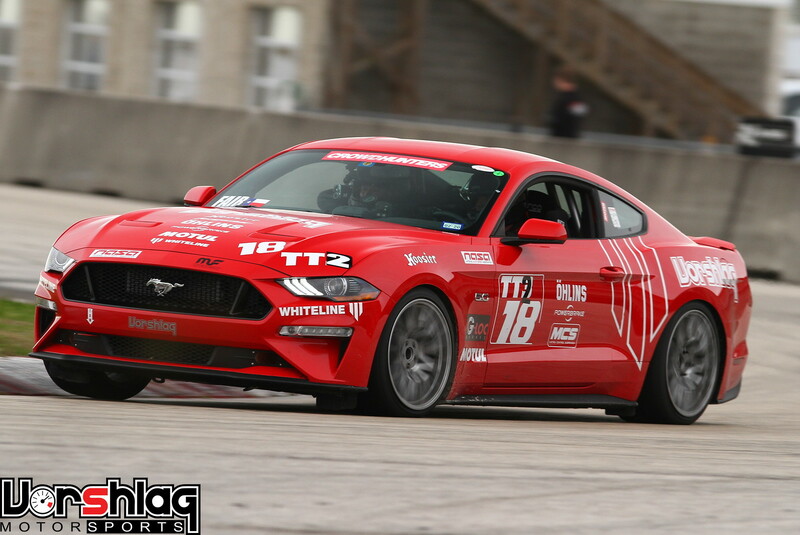 Speaking of things that come on the Performance Pack GTs... the PP 15" brakes are a huge improvement over the inverted hat 14" brakes that come on the base GT or Ecoboost Performance Pack cars, especially the base Ecoboost and V6 brakes. 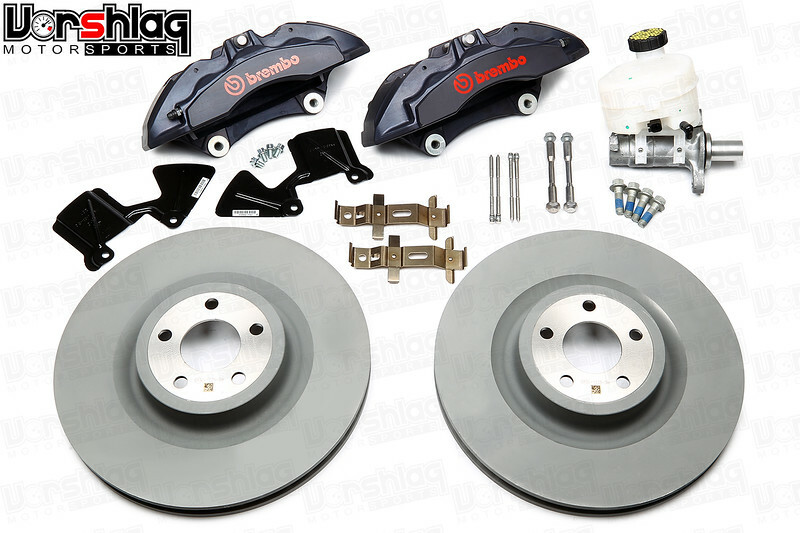 We have talked about this here before, and until now we only offered the 380x34mm Powerbrake big brake kit. 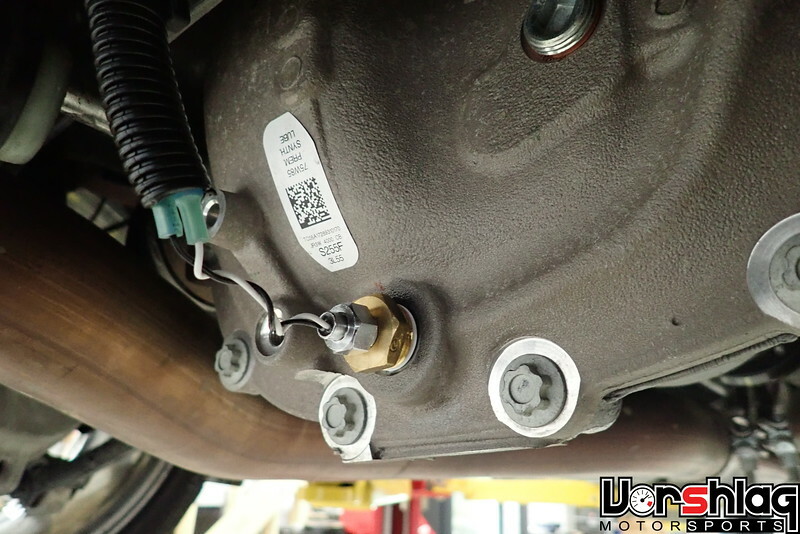 That just isn't in everyone's budget, so we did some research, checked a number of new sources, and put together our own version of the PP brakes for sale. 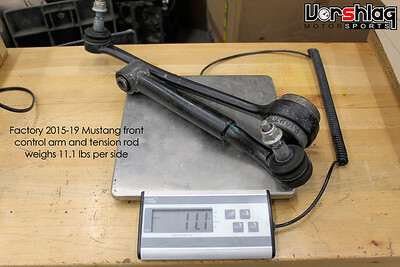 This Ford based kit we assembled is heavier than the Powerbrake BBK, but the price is significantly less. 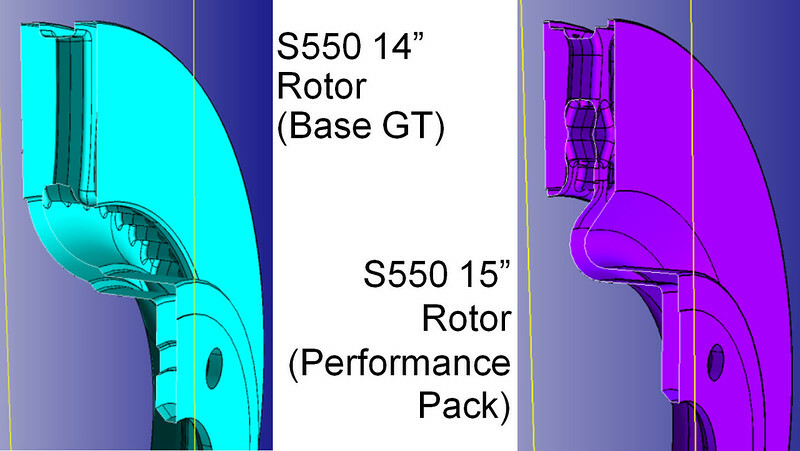 When Ford built the S550 they tried a new technique for the rotor design on the front and rear, in all sizes: the ridiculous "inverted hat" rotor design, shown above left. 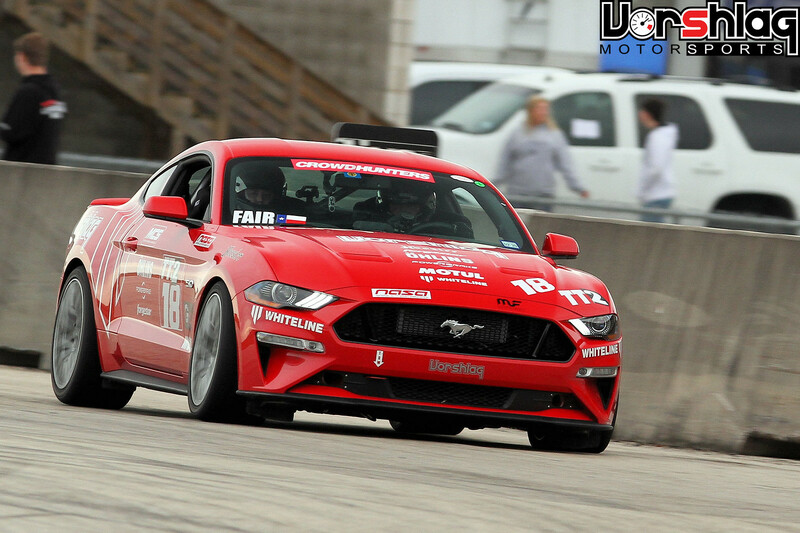 Initially both the 14" and 15" rotors had this "no way to cool" design, but an engineering team at Ford led by our friend Marco proved the inverted hat design can not work on track. He has reams of test data to back this up. We talk about a lot of that in this forum post. 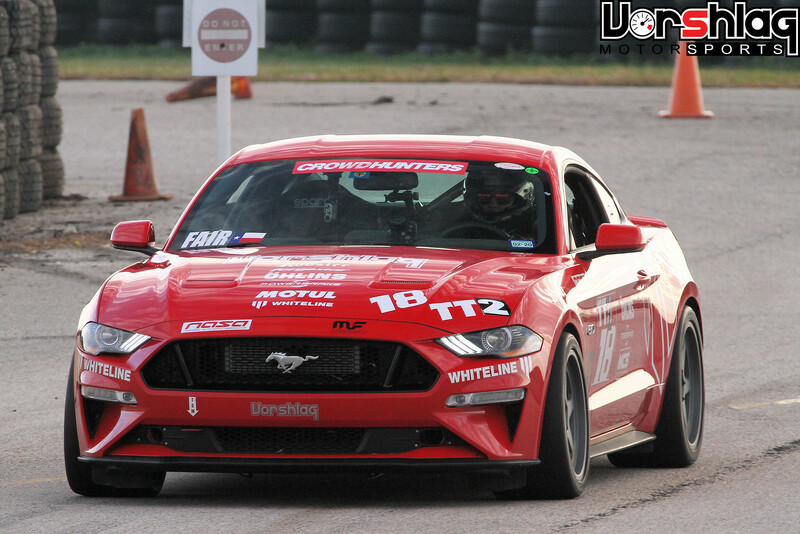 The track worthy solution he pushed through, at least for the 15" Performance Pack brakes, was to go back to a conventional rotor design as well as some tunnels in the undertray and cooling deflectors. 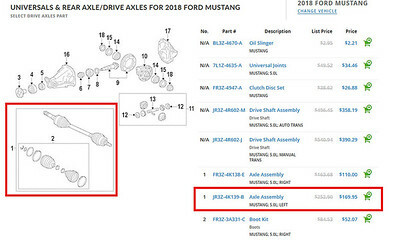 This all happened right before the S550 was released, and some of the inverted hat 15" parts are still floating around out there. We accidentally got a set of brake backing plates from these backwards 15" rotors when we were putting together our 15" 6-piston Brembo upgrade kits - which we showed Marco and he got a good laugh at seeing. 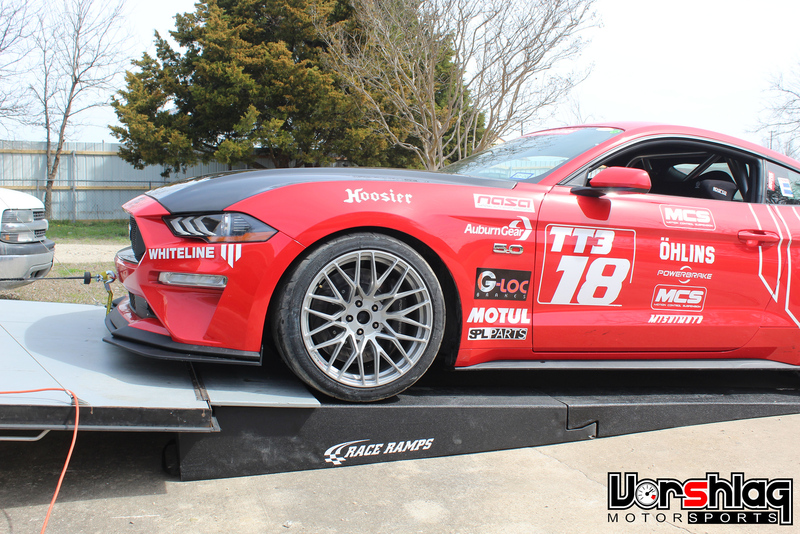 After ordering a variety of parts to see what worked together best, we put together our version of the 6-piston 15" Brembo kit for the 2015-up non-Performance Pack cars to get the maximum benefits of that testing and development. If you have the inverted hat brakes on your S550 Mustang and plan to do more than parade lap pace on track, you will want to look at this upgrade. 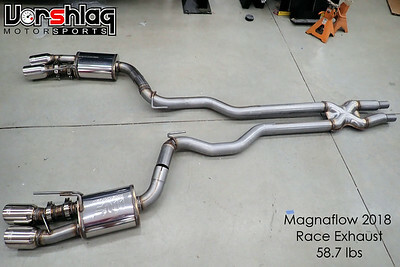 After camber adjustment, this should be the next track upgrade on your list. 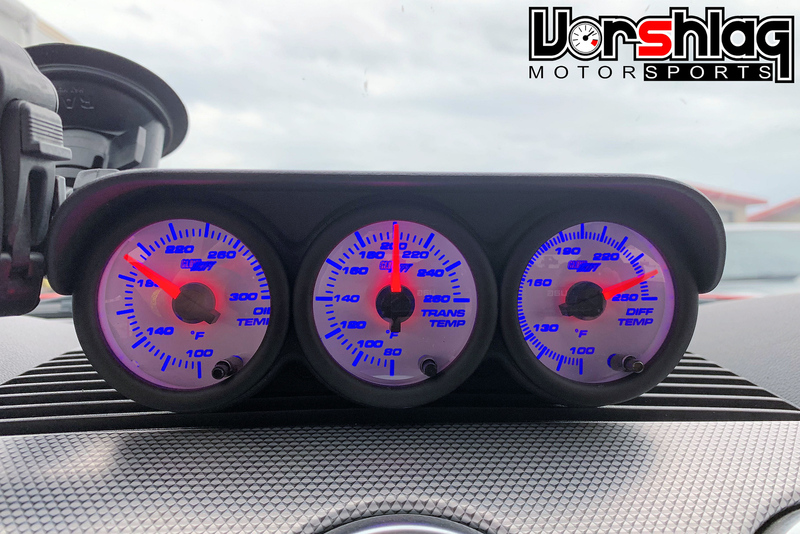 Our kit even includes the required master cylinder (one for manual, one for automatic), unlike the Ford Racing M-2300-V kit that is priced higher. 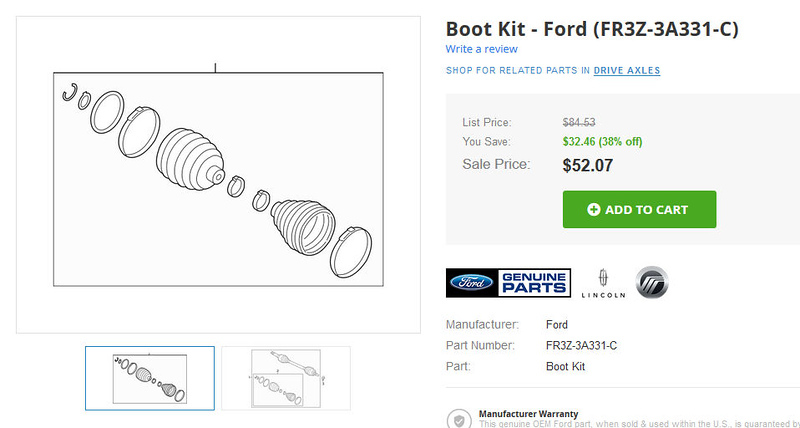 And we use all new, Ford-sourced parts. 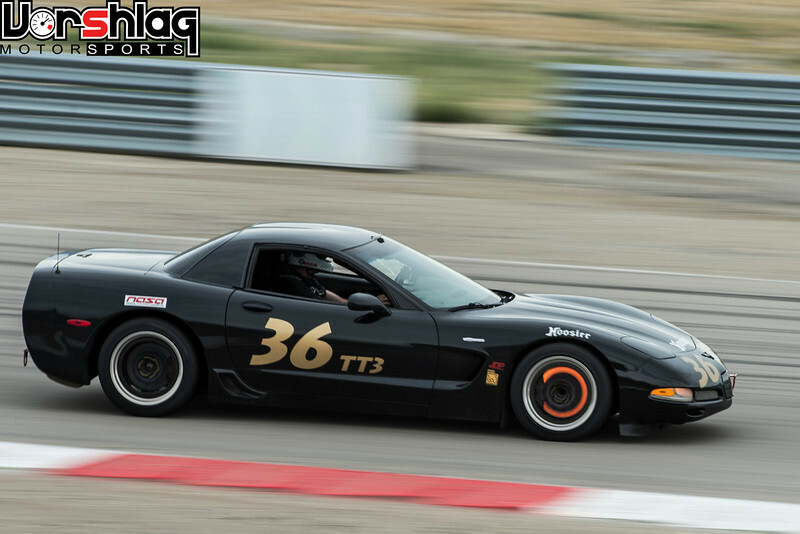 Of course you can still get these brakes hot on track, so good track pads, track rated brake fluid, and even brake cooling is still a good idea. If you can see the rotors glowing, they are getting hot enough to cause trouble! 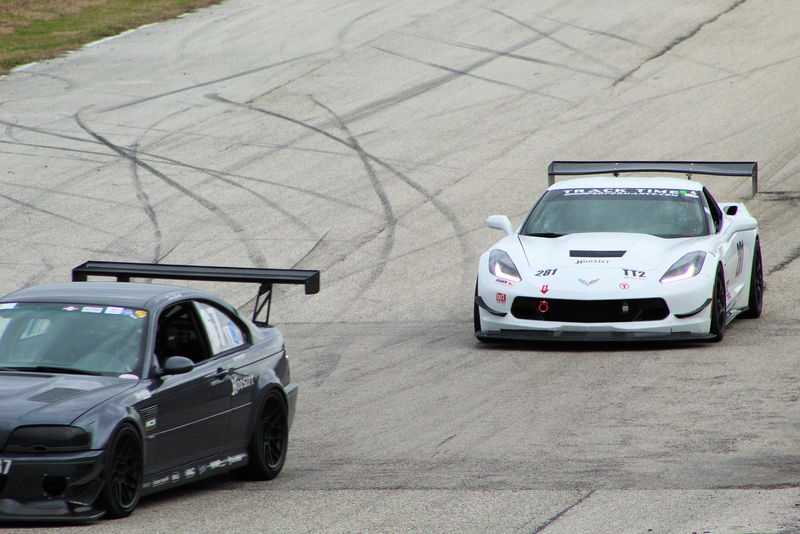 Nobody likes "losing the brakes" on their car on track, most of all me. 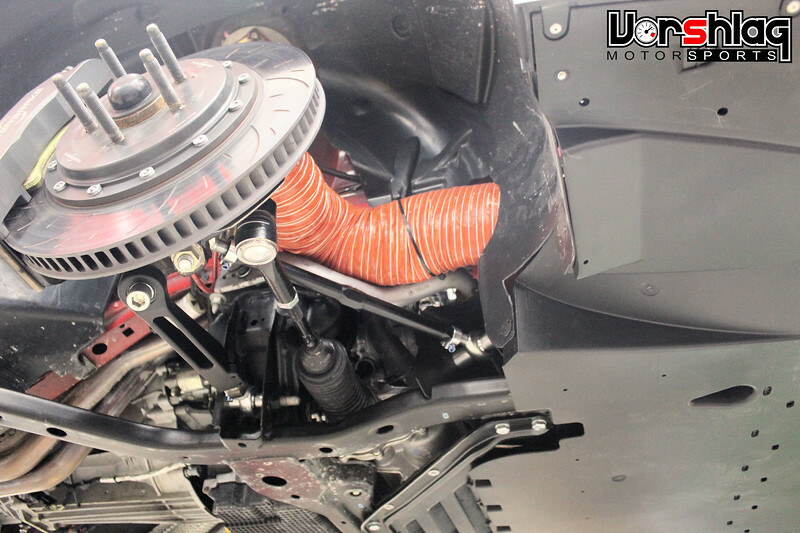 We have brake cooling solutions for the S550 15" PP brakes and the 21 pound lighter 380x34mm Powerbrake option for this chassis, of course. 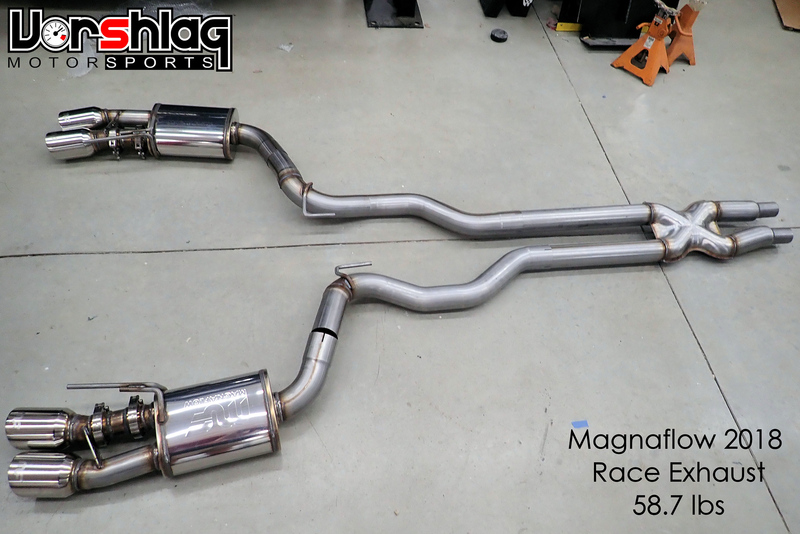 The Magnaflow "race" exhaust has been on this car since the beginning and was the only mod when we got our "baseline dyno" pulls last year. 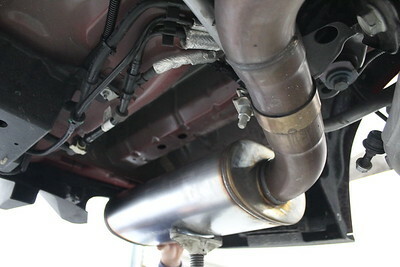 It fit great, sounded great, and had provisions for the optional exhaust bypass valves (which our car did not have). 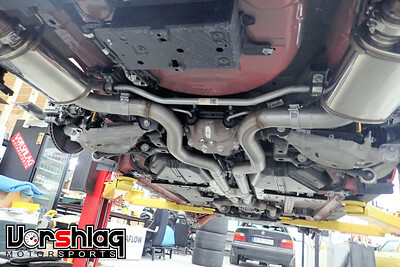 Once we installed the long tube headers the sound got to be a little bit much. This thing sounded like a full blown race car at the January MSR-H event, just minus the full blown race car lap times. 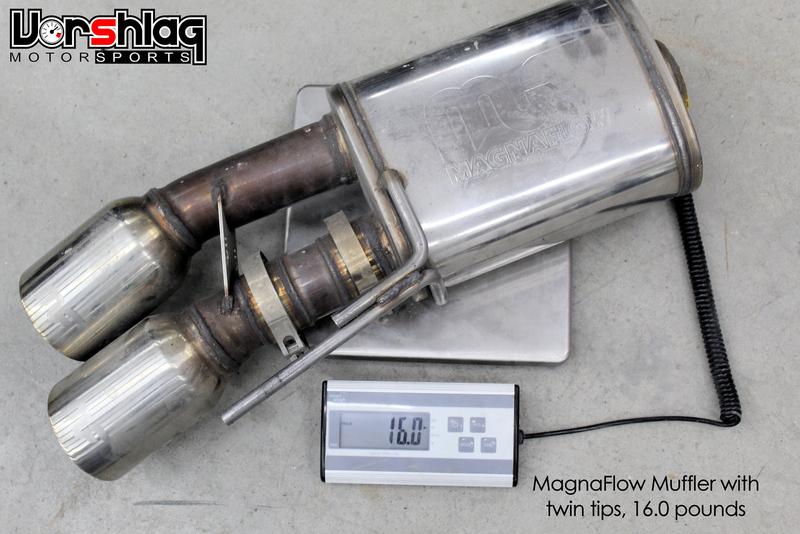 I took some measurements of the existing exhaust and back of the car and found the biggest Magnaflow mufflers in the same 3" tubing diameter. 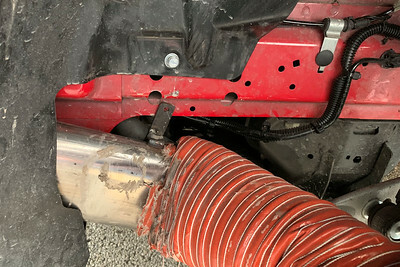 After many years of testing this theory we know how much muffler case volume works in knocking down decibels of sound, but the right style not only keeps the same power level it usually ADDS power. This Magnaflow 12249 part has a straight through design you can stick your arm through, but more batting inside. We mocked them up and they fit, as long as I was OK with losing the two exhaust tips and the space needed for the bypass valves (which this car doesn't have). I was worried that the larger muffler would add a few pounds... nope!The smaller case "race" muffler was heavier when you added in the twin tips and the straight pipe adapter for the bypass valve. The new setup was 9 pounds lighter. 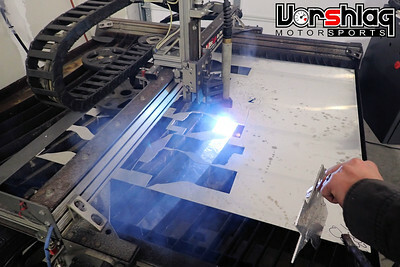 The installation was a bit custom, with some cutting and welding. 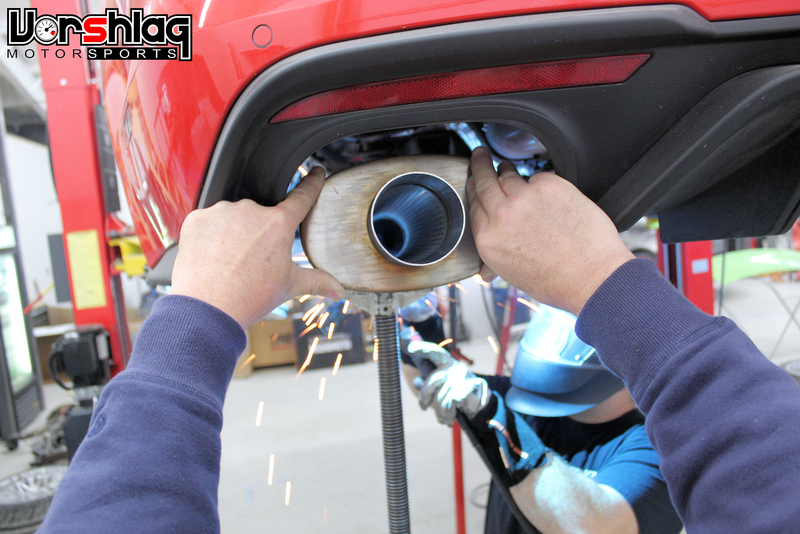 I snapped this shot while the muffler was being welded in - the arc light inside shows the straight through muffler design. 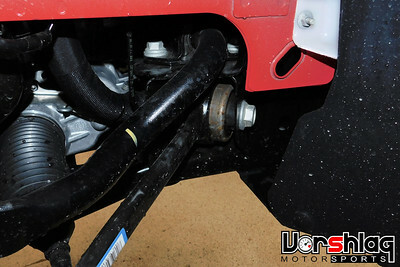 These were welded in and some brackets were added to line up with the factory mounts on the chassis. 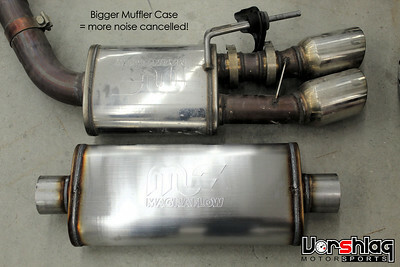 We went without any tips and just have the muffler cases stuffed up into the back of the car. The first time they fired up the car.... WOW! So much quieter! 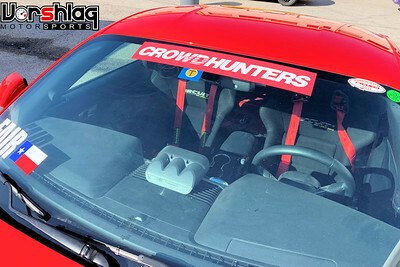 I've driven the car with this setup at another track event and an autocross, and at both events had people come by and ask "What have you DONE to this car?! It sounds amazing!" And it really does. Very happy with this, and we will see soon if it made a small improvement in power. One of the best improvements on the S550 chassis over the previous generation S197 Mustang, is the double-ball joint front suspension. This was lifted straight from the BMW playbook, but it works. 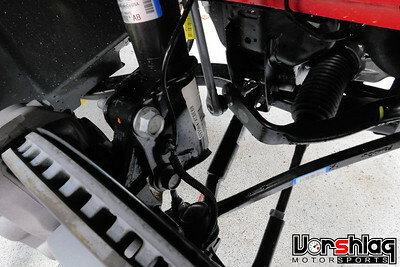 There are some big rubber bushings in this suspension, especially the forward hydraulic bushing in the front location (see below right). 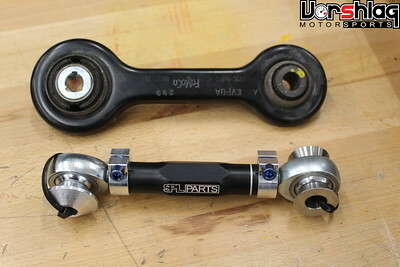 Our friends at SPL Parts have two products to replace the front lower control arms. 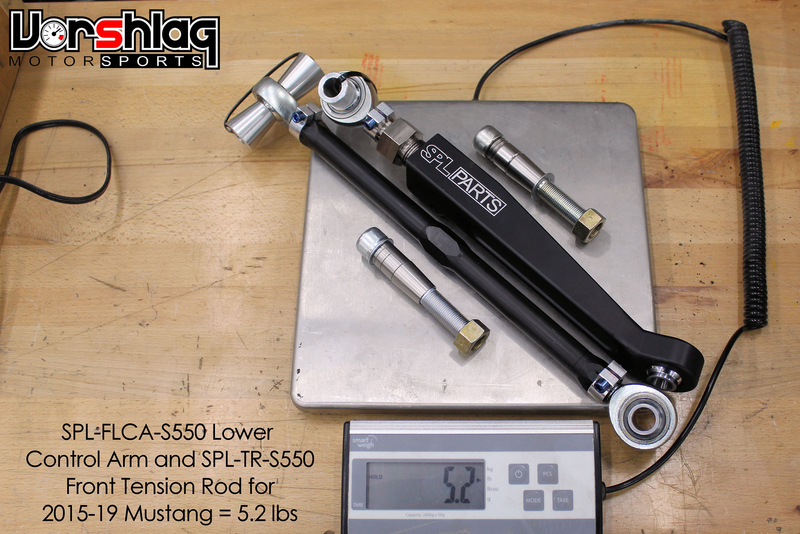 Their S550 Front Tension Rod kit includes the replacement arm that gets rid of the massive hydro bushing, replacing it with a spherical. This arm is also adjustable in length and has geometry correction at the spindle side (with a spherical and adjustable height pin). This went in with ease and gives some caster adjustment and other geometry corrections. Removing that massive hydro bushing is key here - and replacing it with high end spherical bushing in that location. The other SPL Parts kit is the S550 Lower Control Arm kit, which is the lateral piece of the 2 arms. 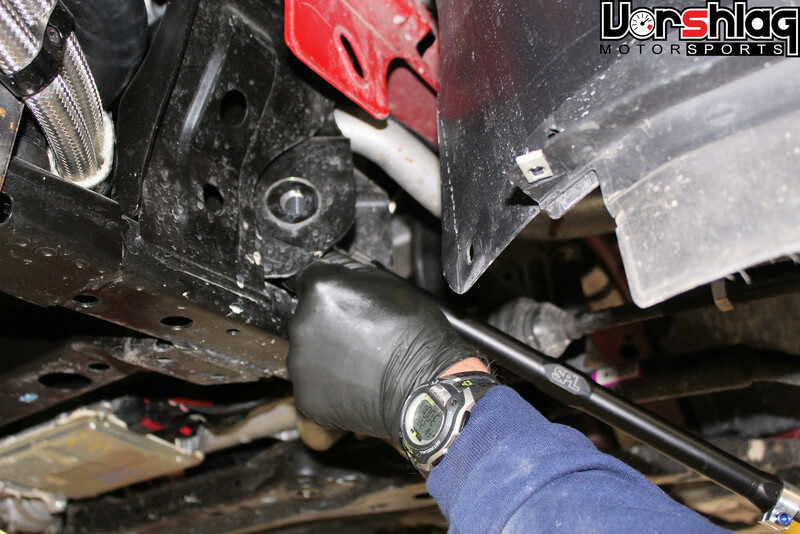 This arm gives additional camber adjustment while also replacing rubber bushings with sphericals - and giving adjustable geometry. With both arms in place we have removed a lot of rubber and hydraulic bushings, added lots of adjustment, fixed some geometry that gets altered when lowered, and... lost some weight? Looks like these are 6 pounds lighter per side, so we lost another 12 pounds with these parts. Not a huge amount, but the small weight drops from this round of changes is adding up. The rear suspension link and swaybar end links above are new, and SPL sent these to us to test. 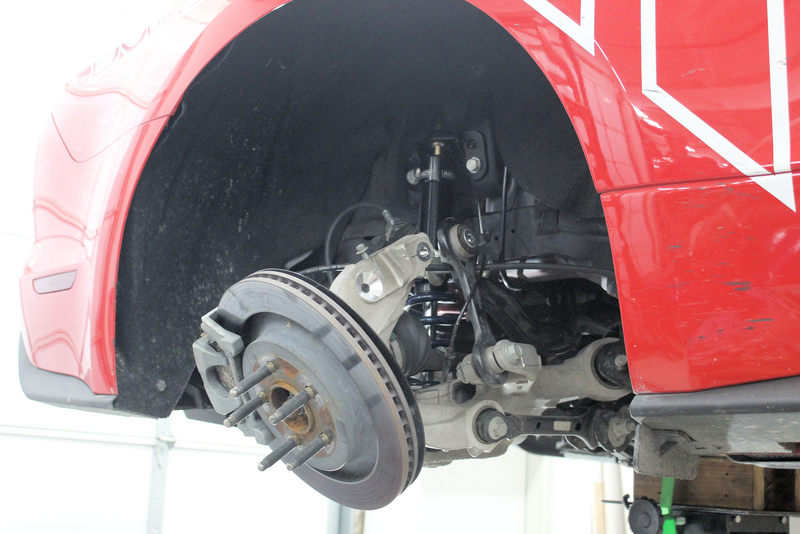 They have been by our shop and at the track measuring some things on our S550, plus we loaned them a rear subframe and complete set of S550 rear control arms. 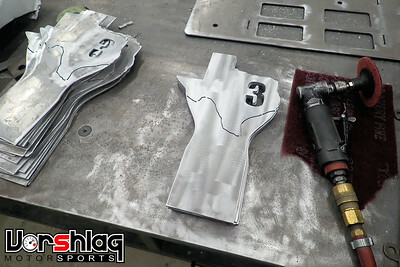 Look for some additional prototype SPL parts on our car for more testing later this season. I will give my first hand impressions of these after an autocross and TT weekend in the next update. This update ran long but we covered our first 2019 competition event and a huge array of new parts added. 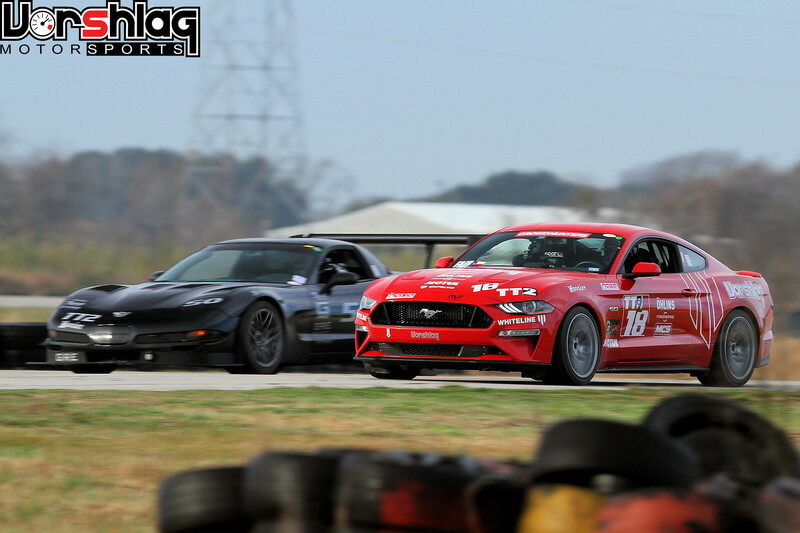 Next time we will cover two more events where we get to test all of these upgrades (on track and autocross). I will show the new weight of the car - which was lighter than I had calculated, and that made moving to TT3 impossible with the Hoosiers. 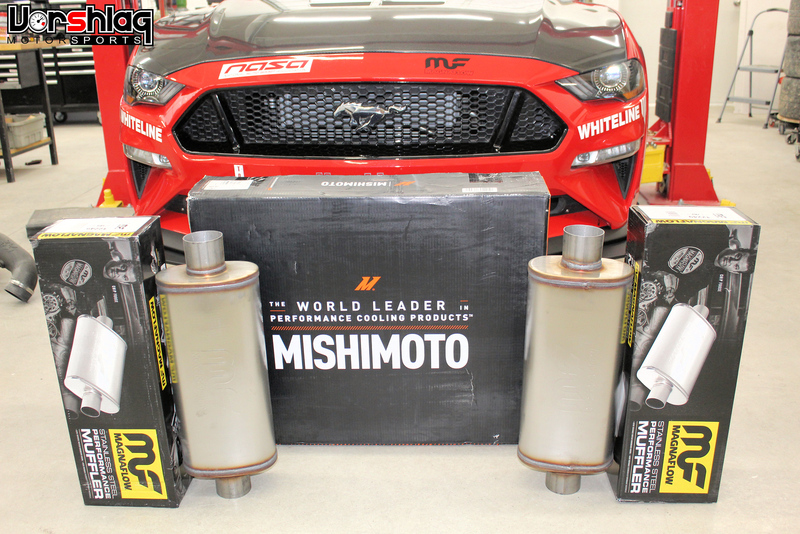 We also added a few more things to this Mustang, such as the Mishimoto radiator. 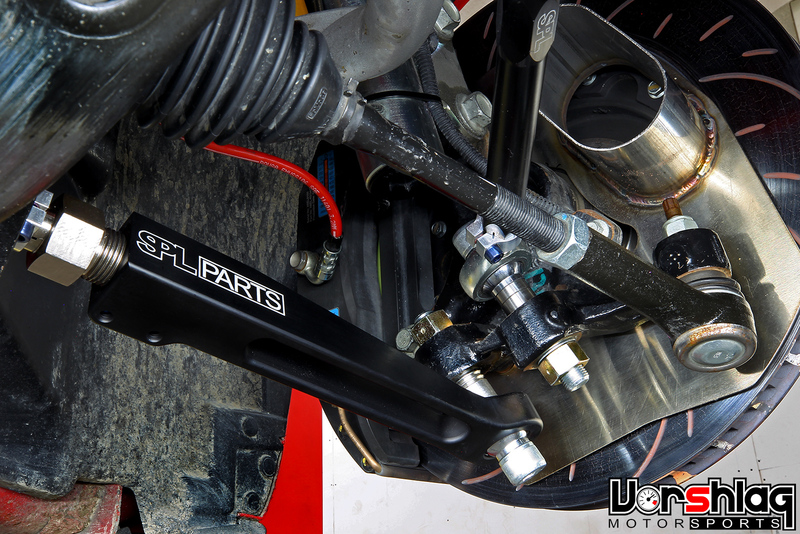 We have pictures of our production S550 and S197 seat brackets, some new prototype clevis style rear shock mounts (requested by one of our shock manufacturers), and some other bits and pieces. jameskhana, flyhalf, Fastfordnut and 2 others like this. I will add these to the site later this week. Making another production batch now. Nope. I sometimes ride a mountain bike, but mostly just run into trees. Great update, that’s a long one! 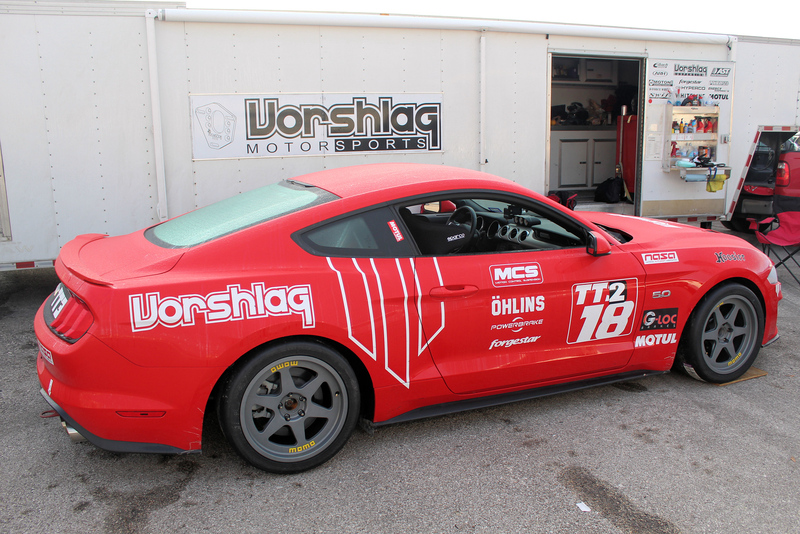 "This thing sounded like a full blown race car at the January MSR-H event, just minus the full blown race car lap times. " thanks for the update Terry. You mentioned hoosiers faster about 1 sec than re71. But what was the lap time vs before on the same track? I mean "aereo " bushing and power adjustment. I think Terry will cover that in his next installment when we go back to our standard test track.